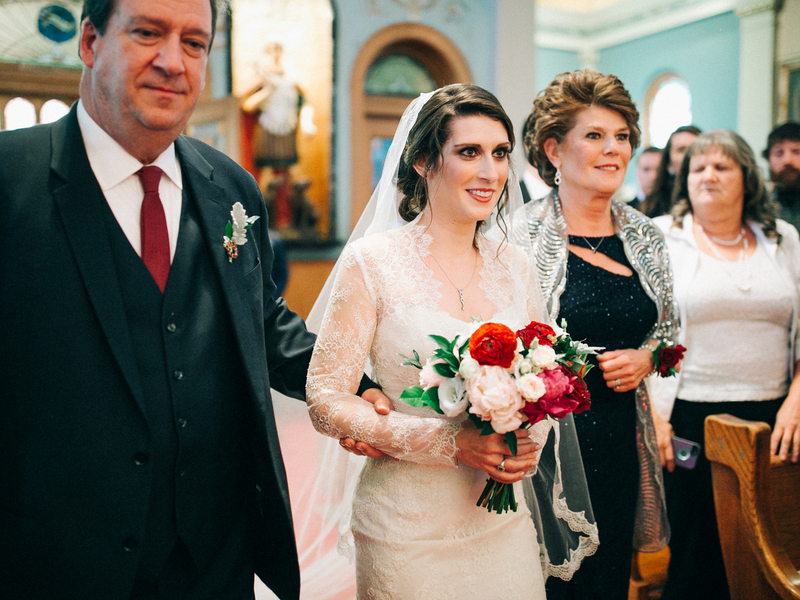 When I met with Paula, Nick and Paula’s parents, they were starting from ground zero. 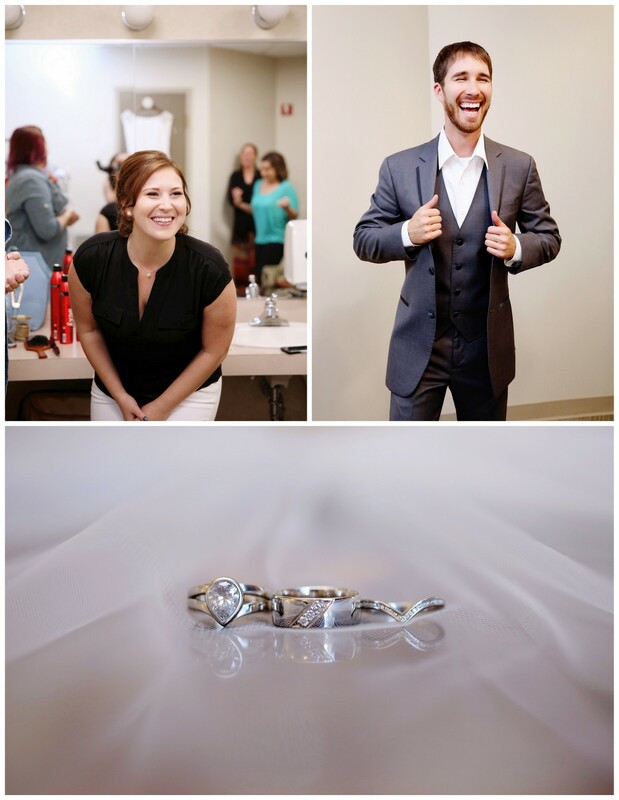 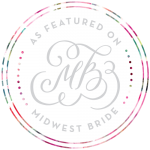 A few things that they did know were that they wanted an elegant wedding and they needed a wedding planner that would walk with them, and more importantly, guide them through the entire planning process. 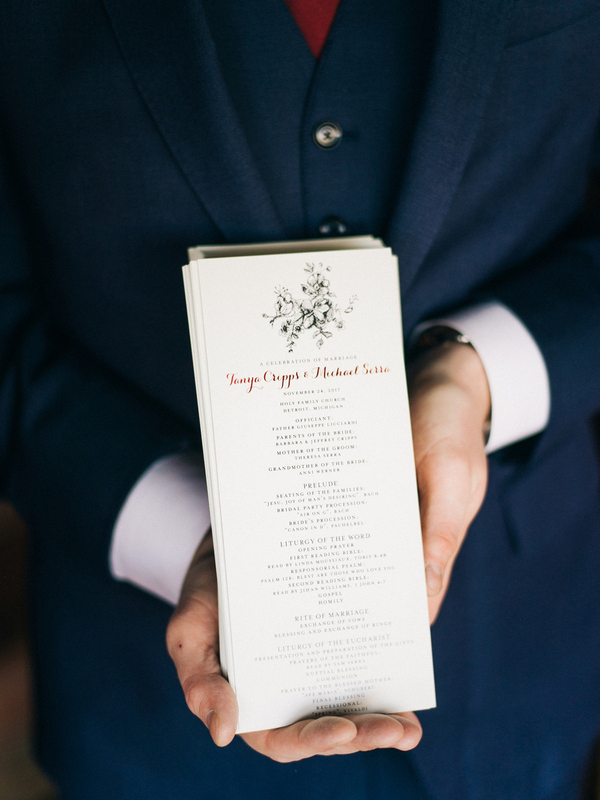 Keeping the design aesthetic consistent in every detail was essential. 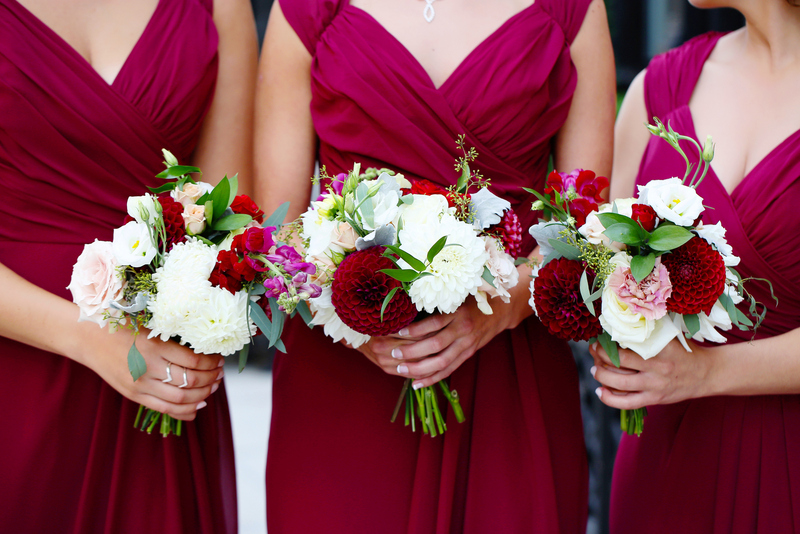 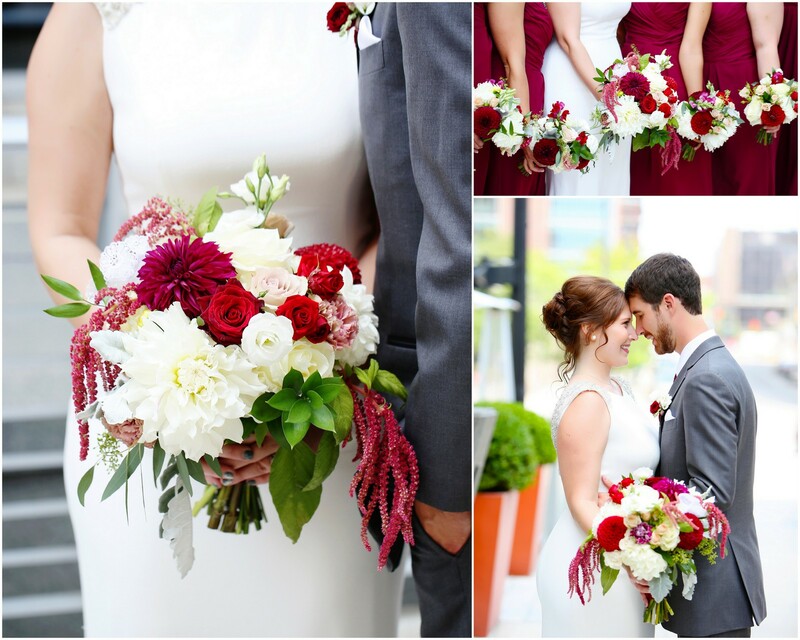 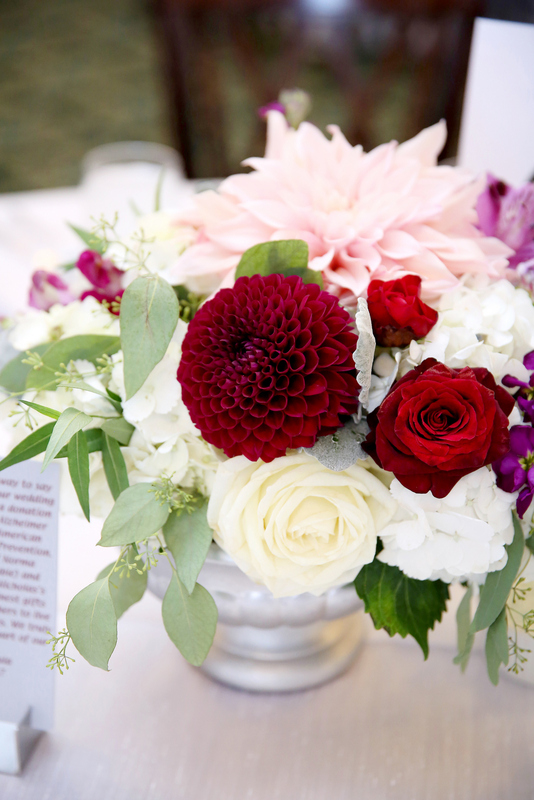 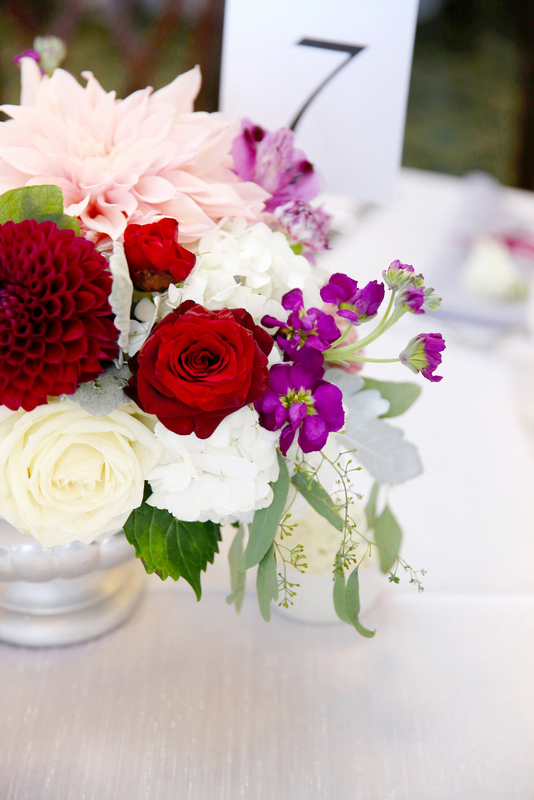 What started as a simple burgundy and grey color scheme evolved into a romantic and dimensional color palette with shades of deep reds, blushes, and pops of mauve. 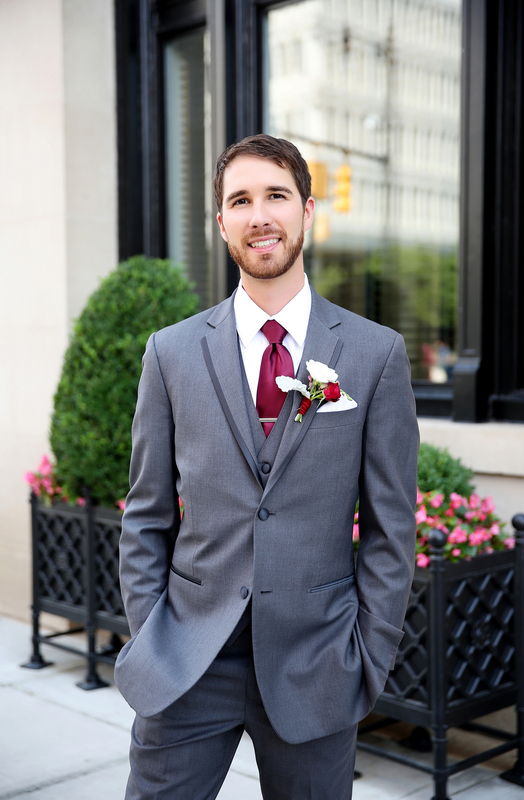 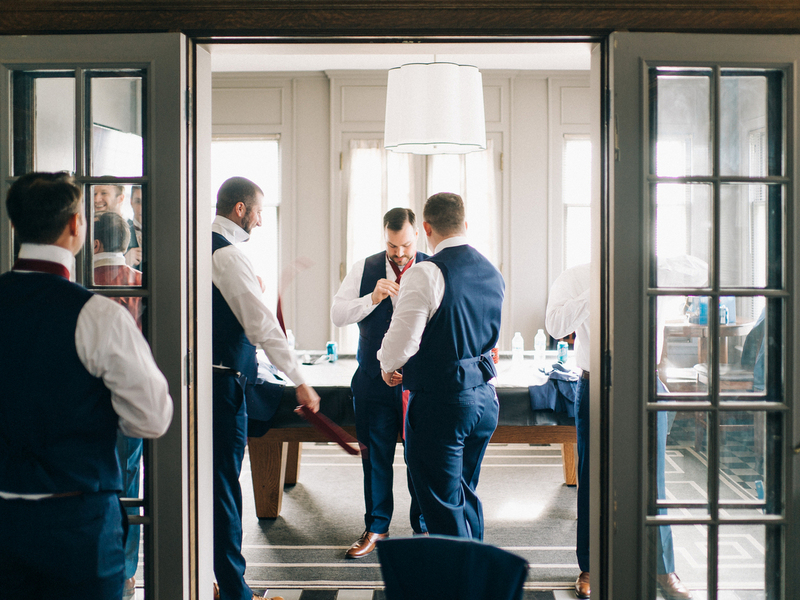 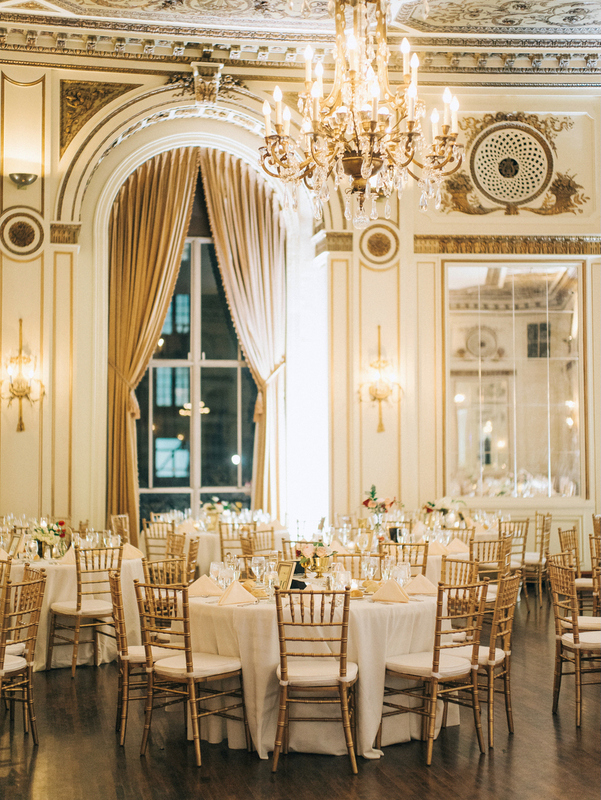 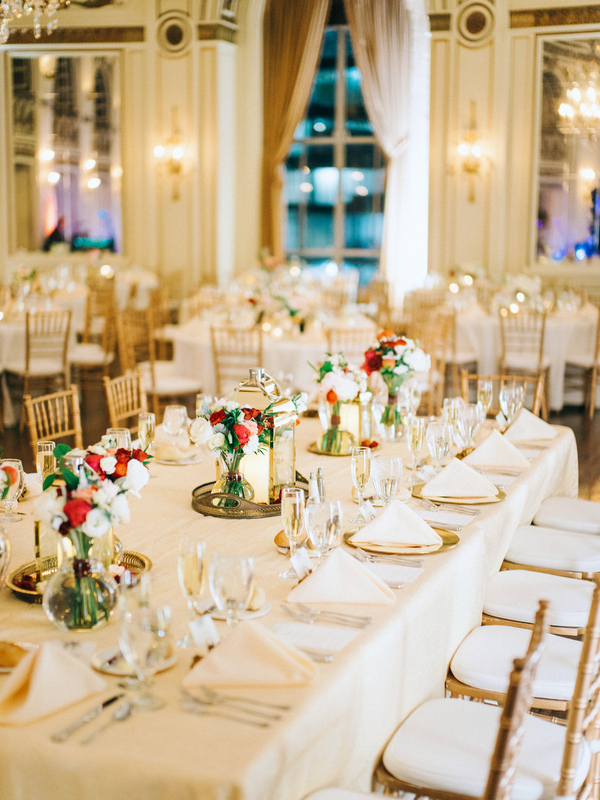 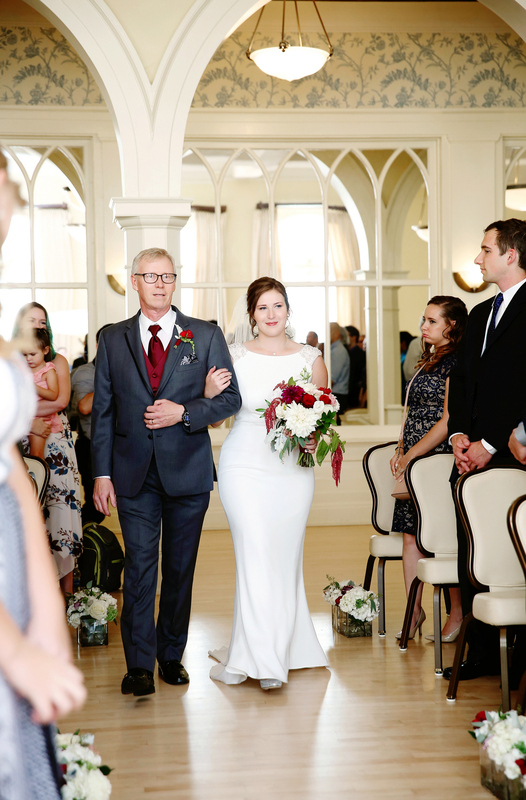 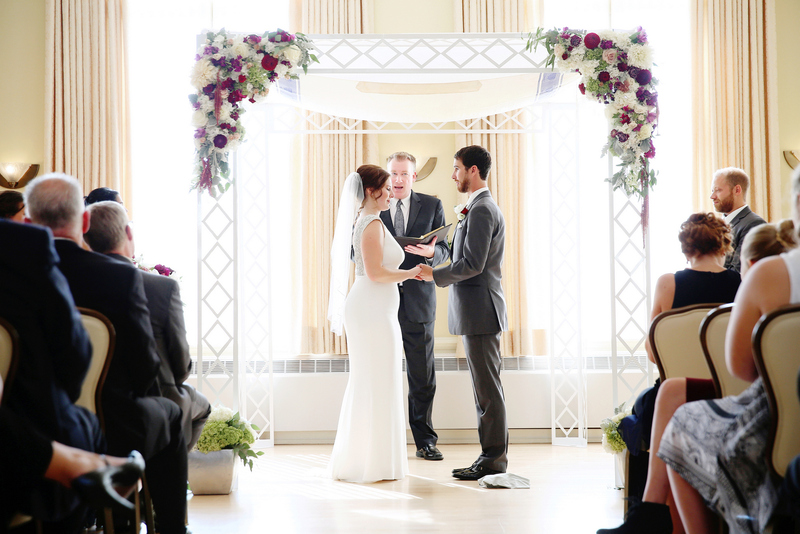 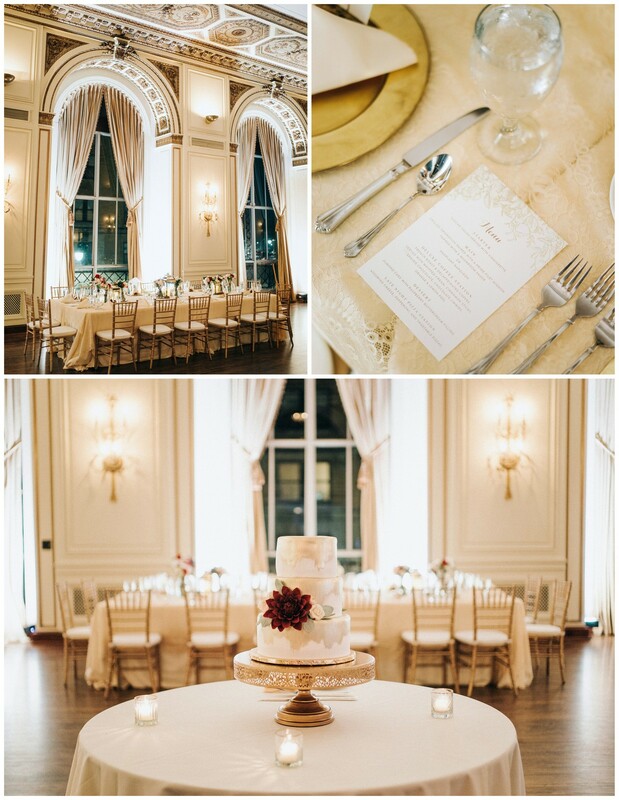 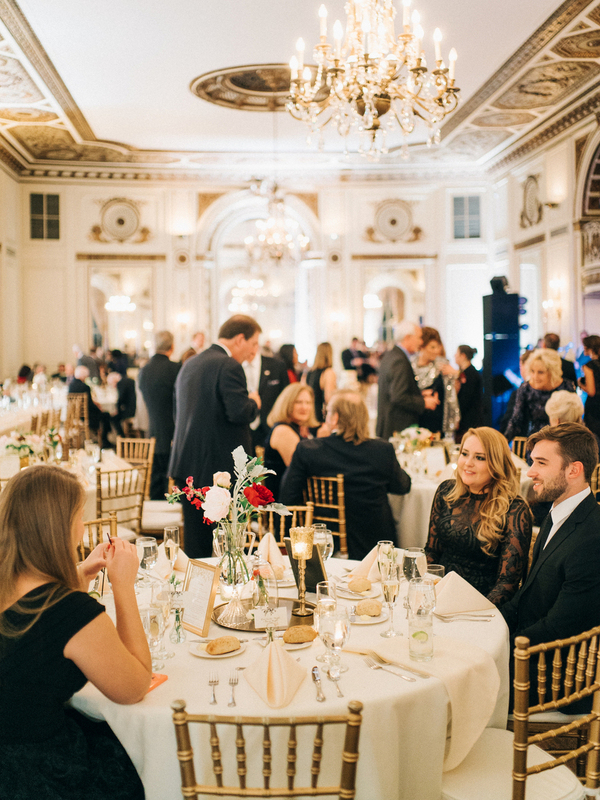 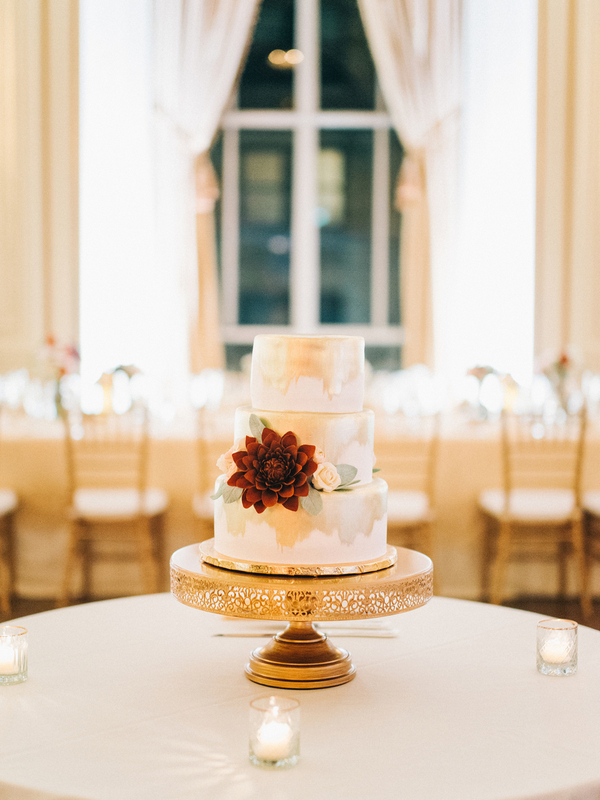 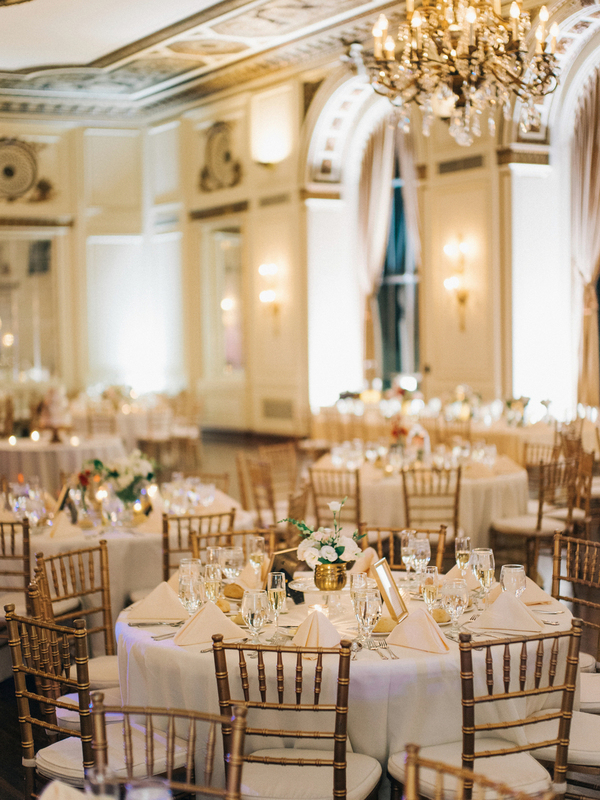 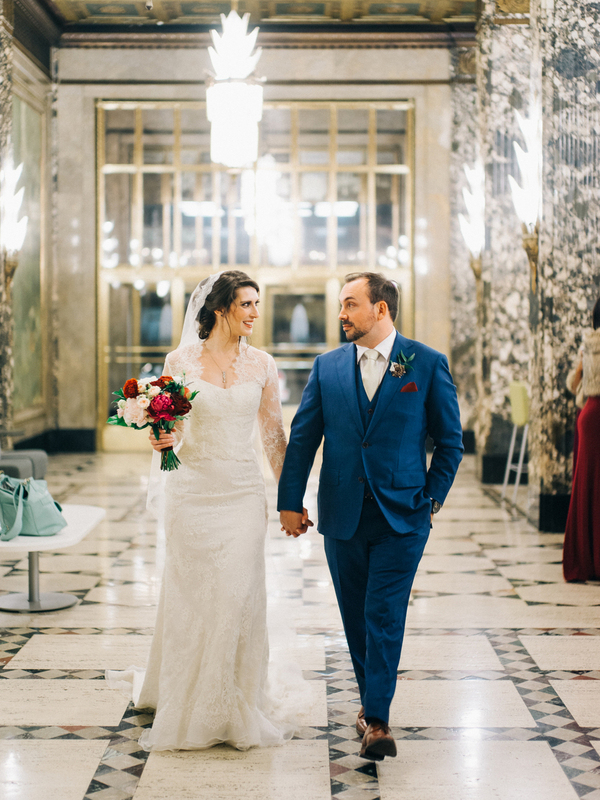 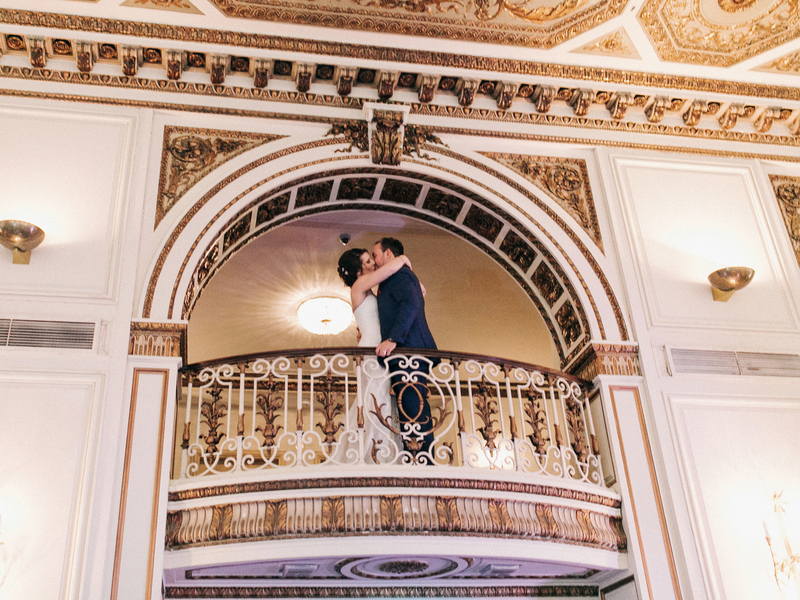 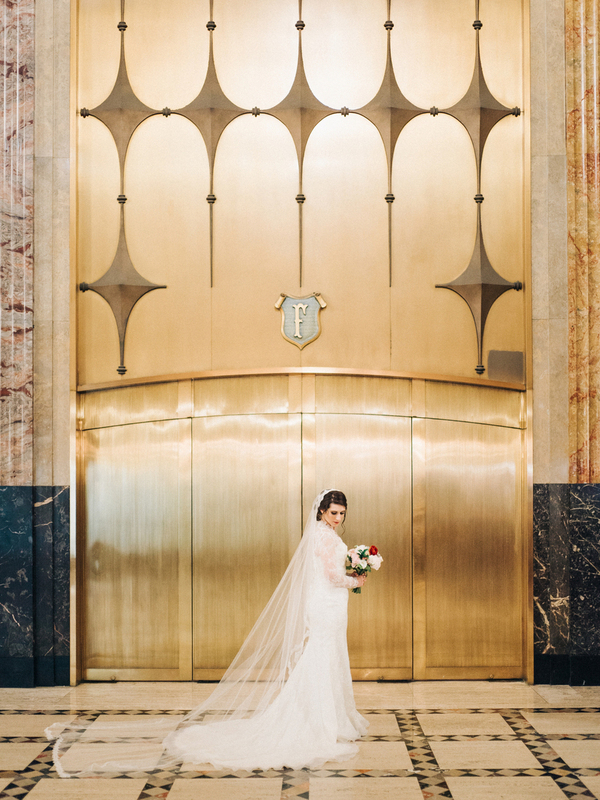 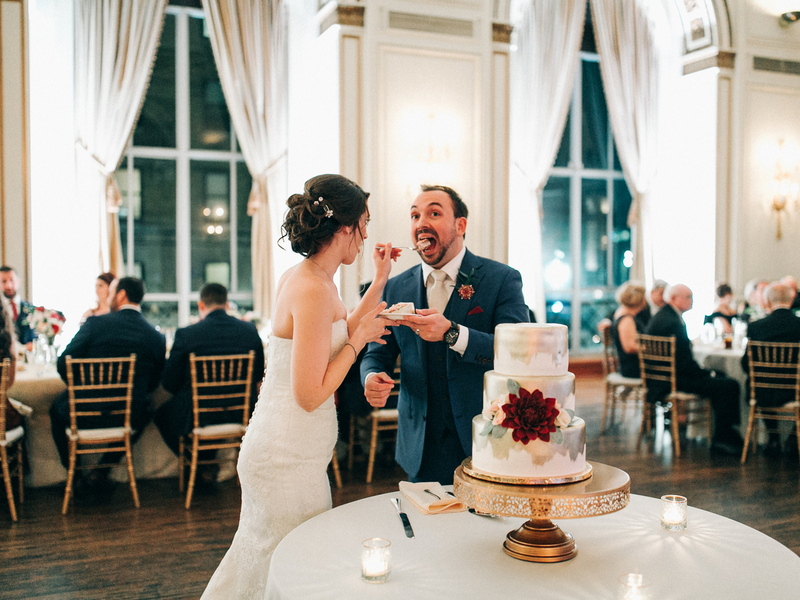 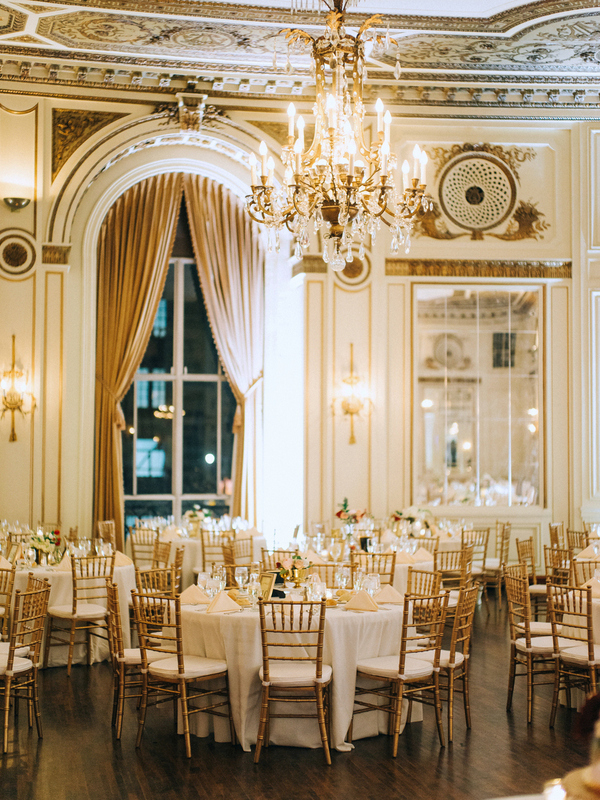 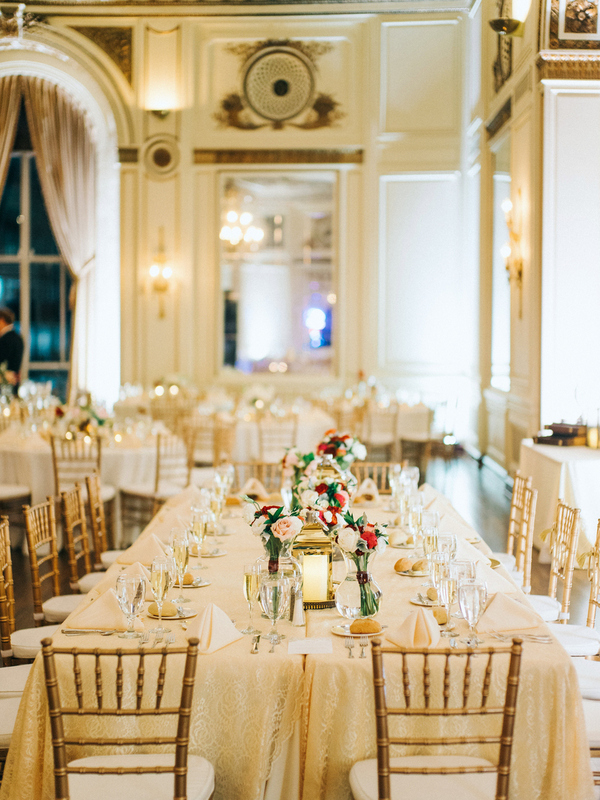 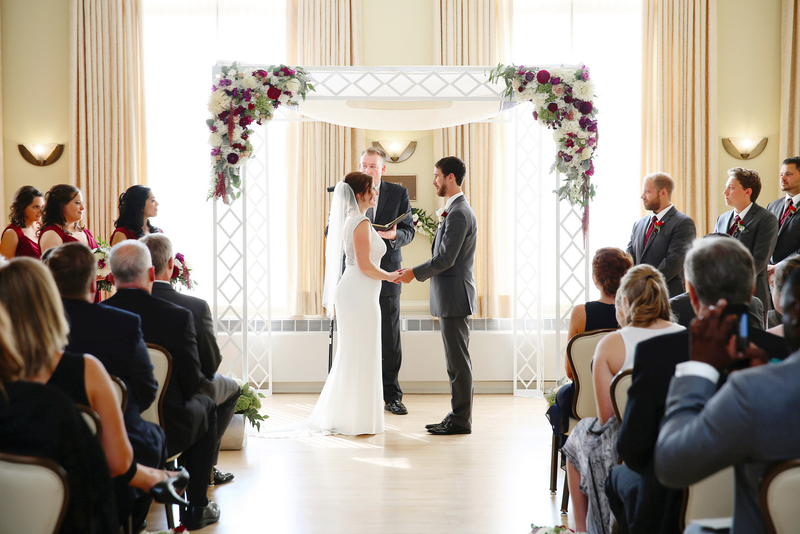 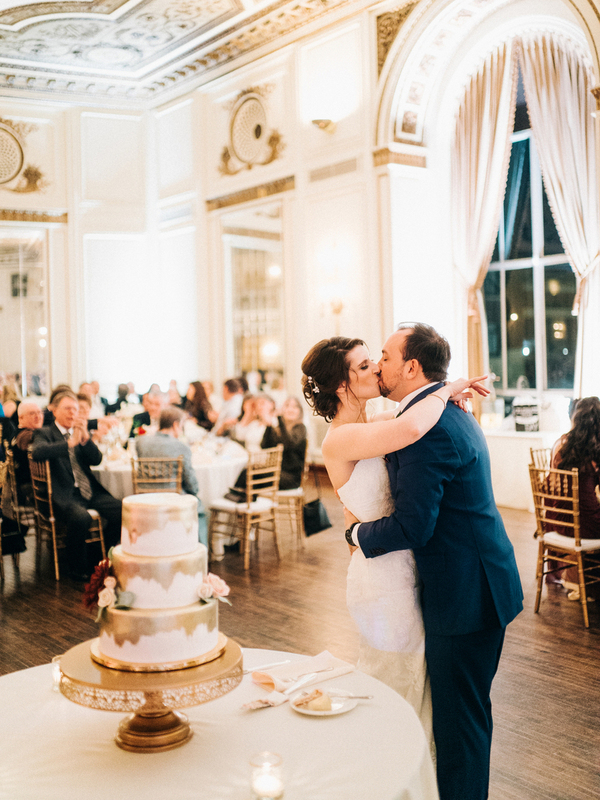 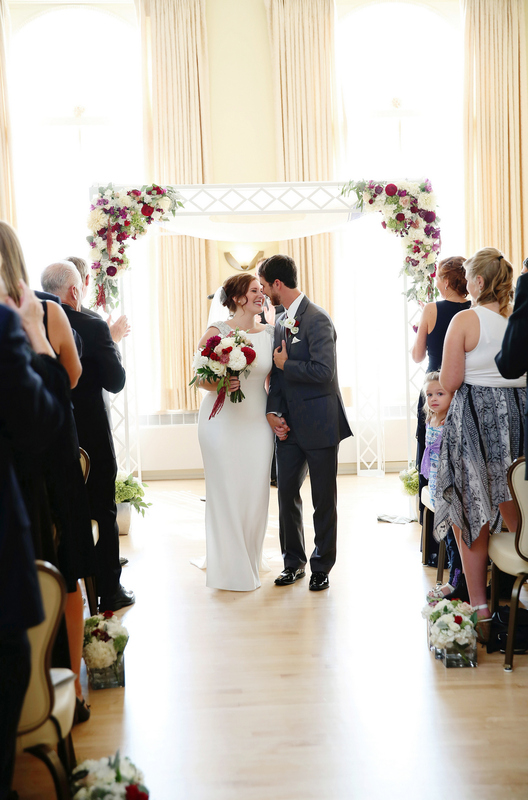 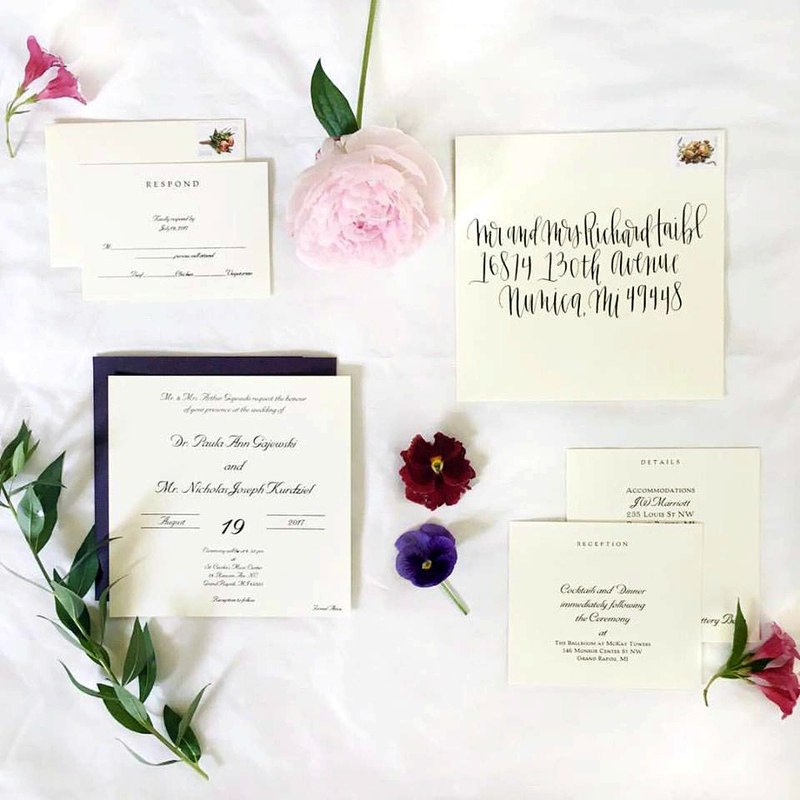 With both the ceremony and reception in ballrooms, it was important to embrace these elegant styles while incorporating some important traditions. 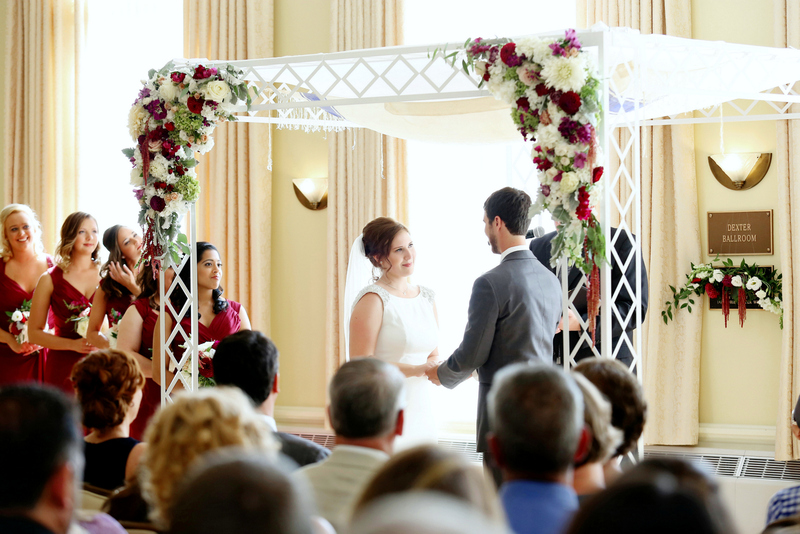 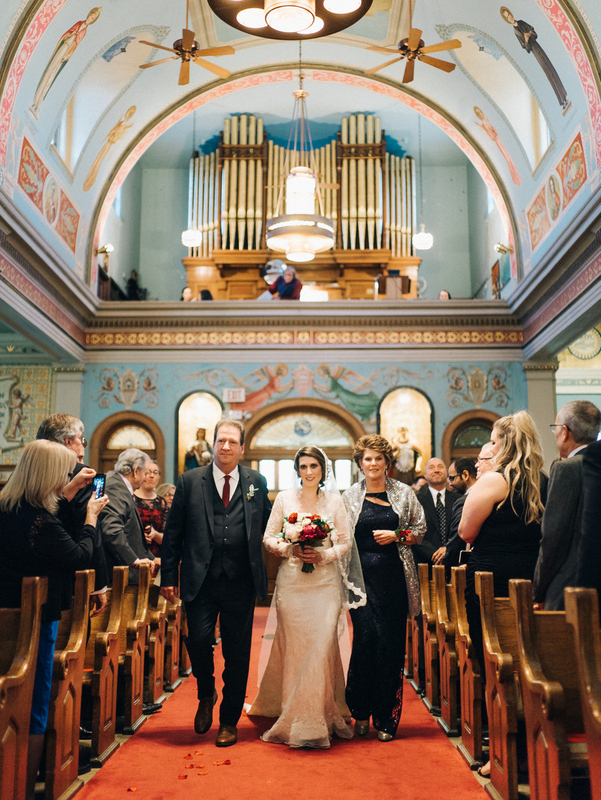 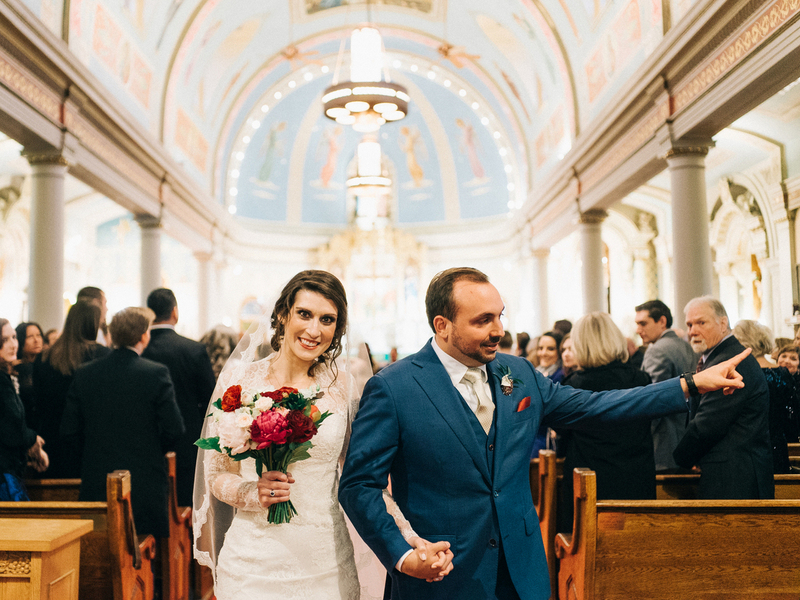 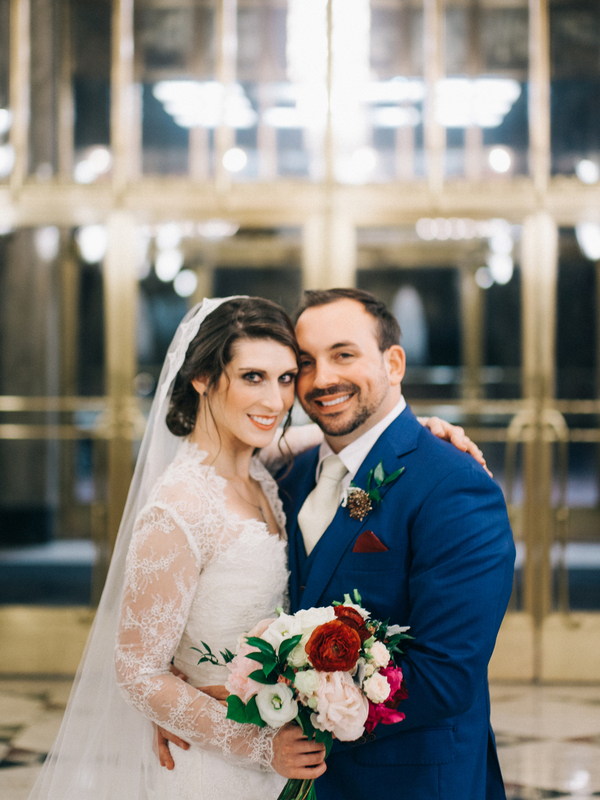 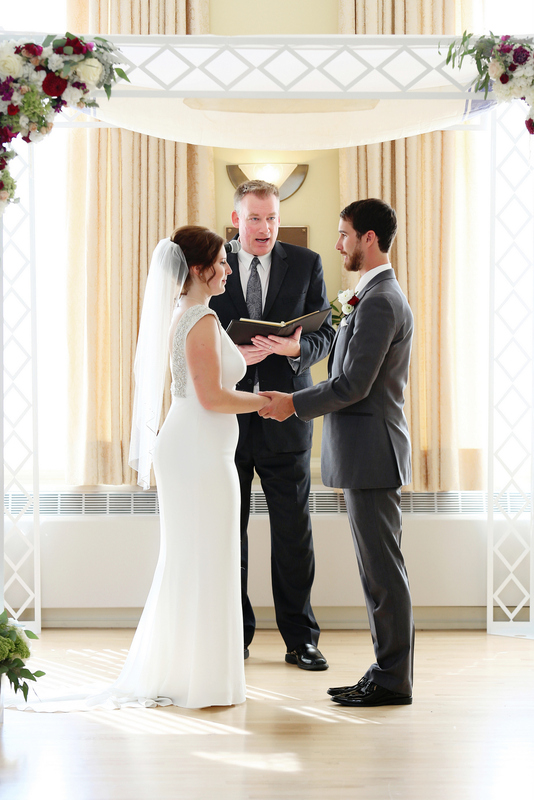 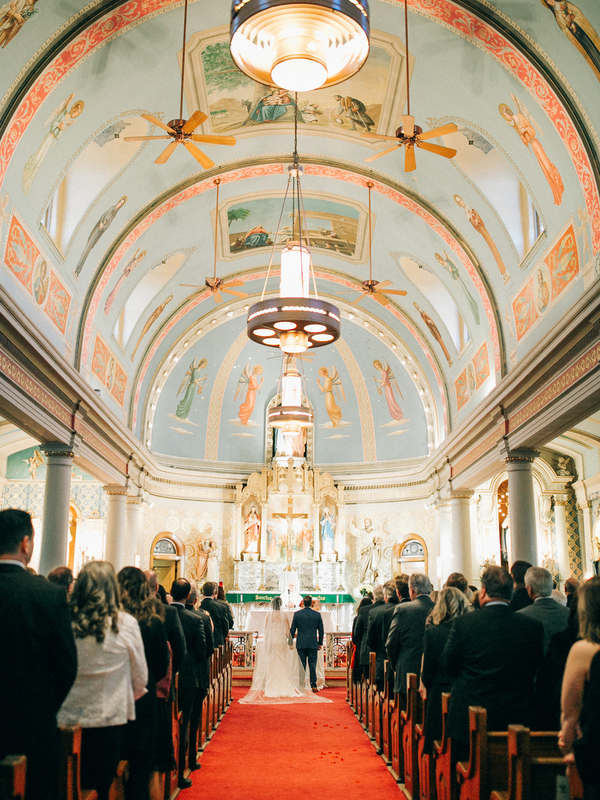 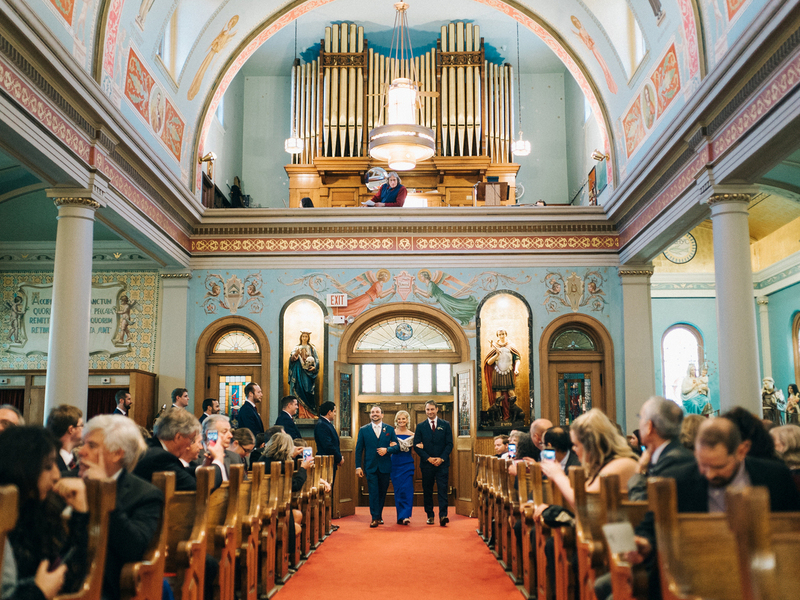 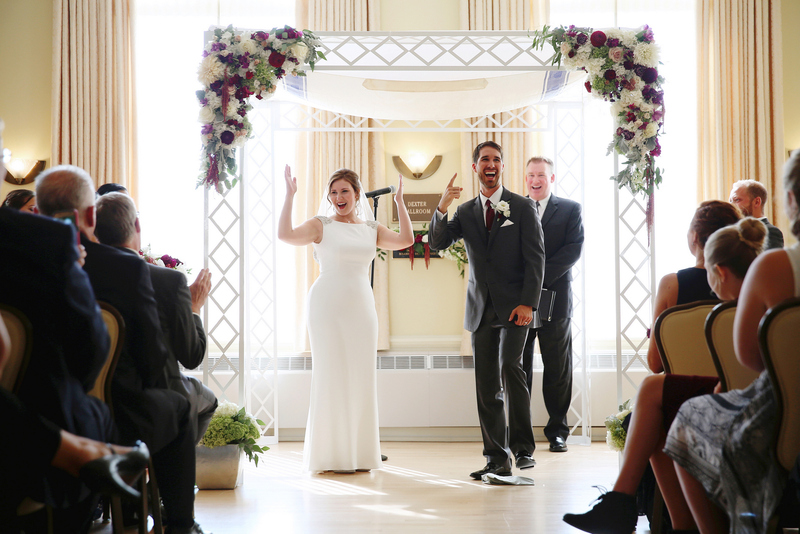 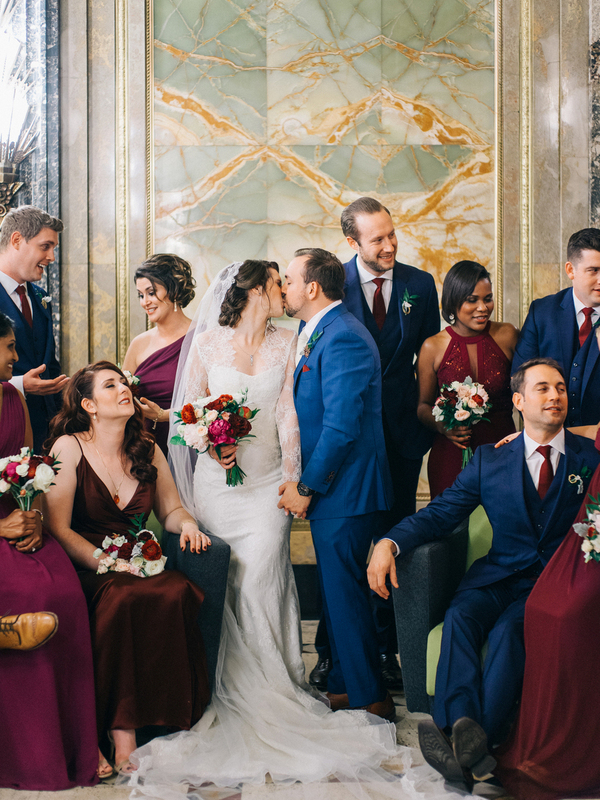 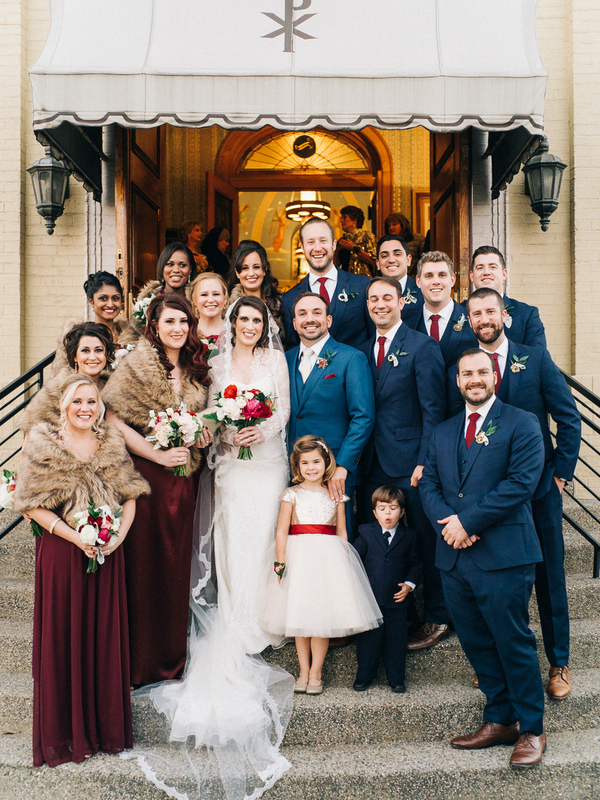 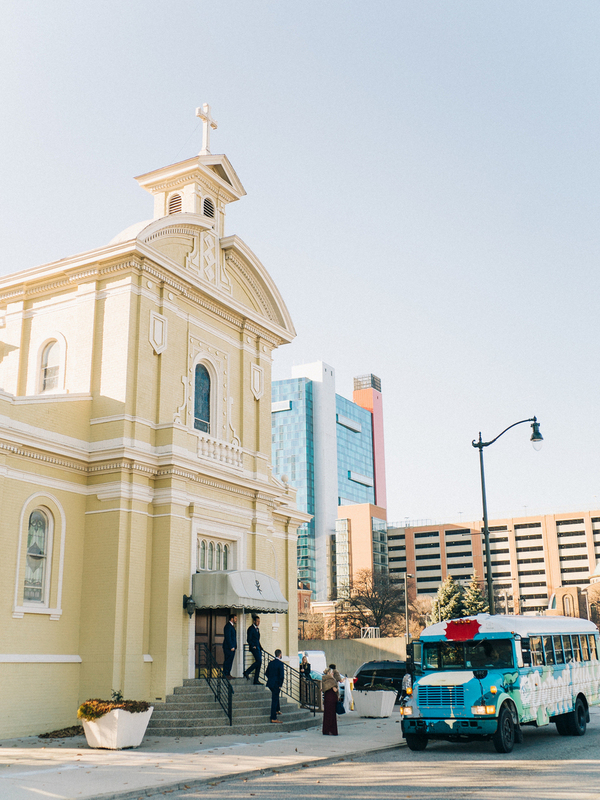 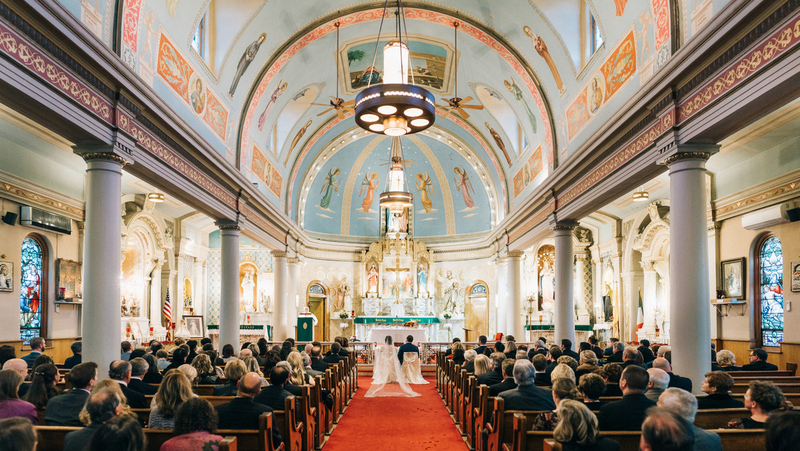 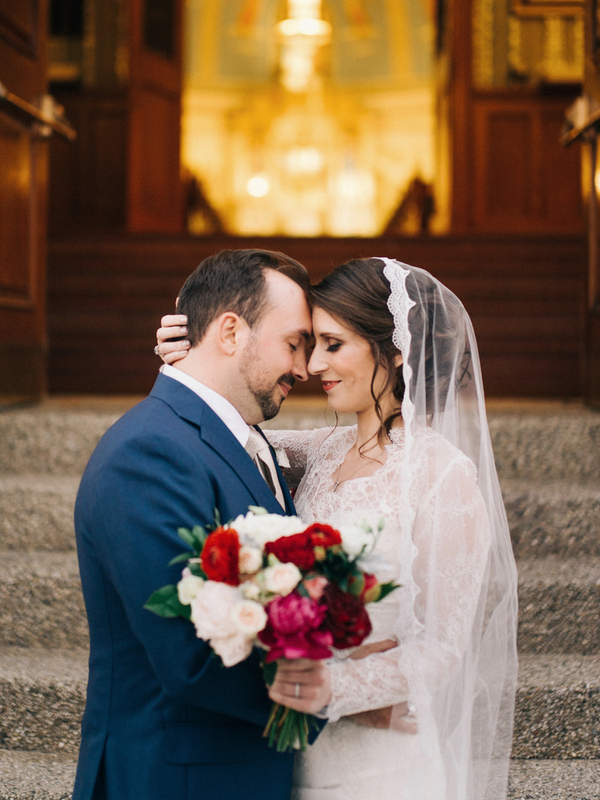 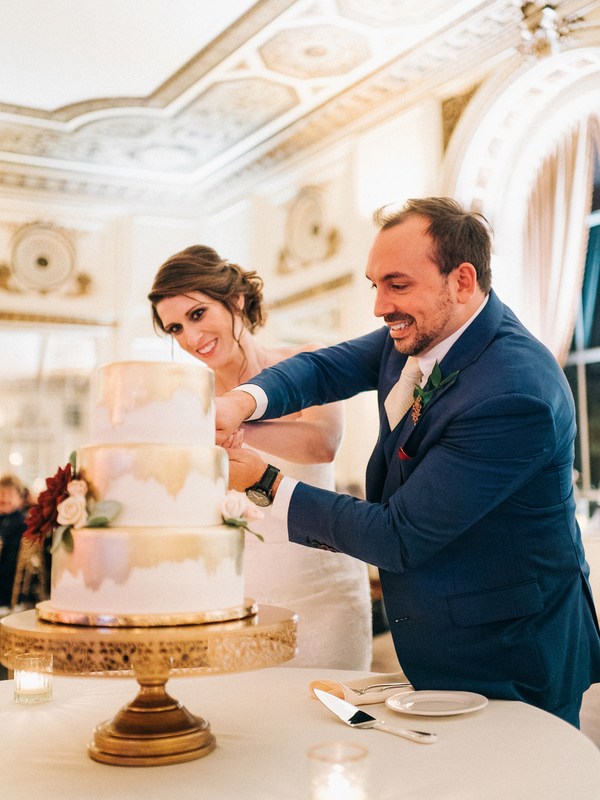 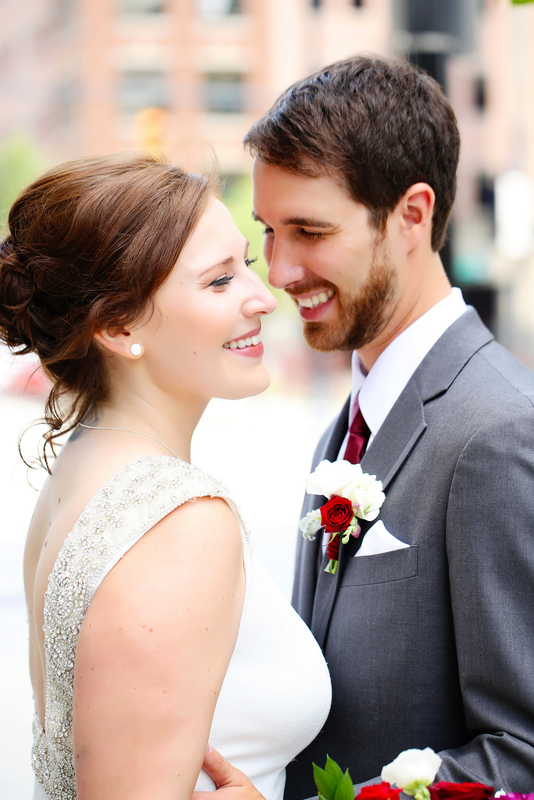 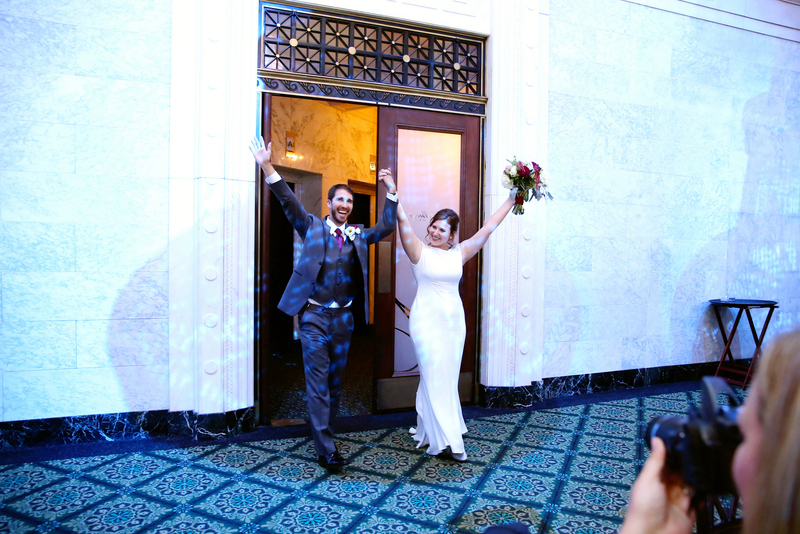 With Nick being raised Catholic and Paula having a Jewish background, they wanted their entire wedding celebration to be special and meaningful for them but welcoming and inclusive for all. 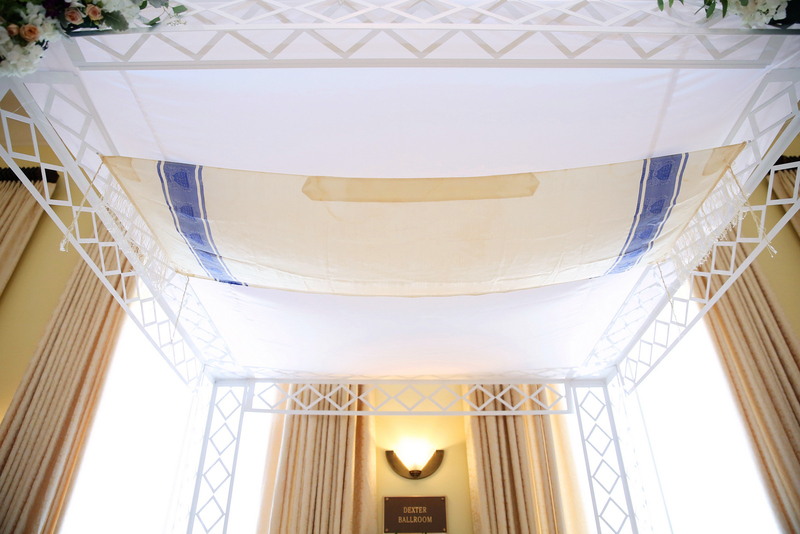 The beautiful chuppah they stood under had her Grandpa’s prayer shawl hanging above them and was adorned in hundreds of flowers by my team. 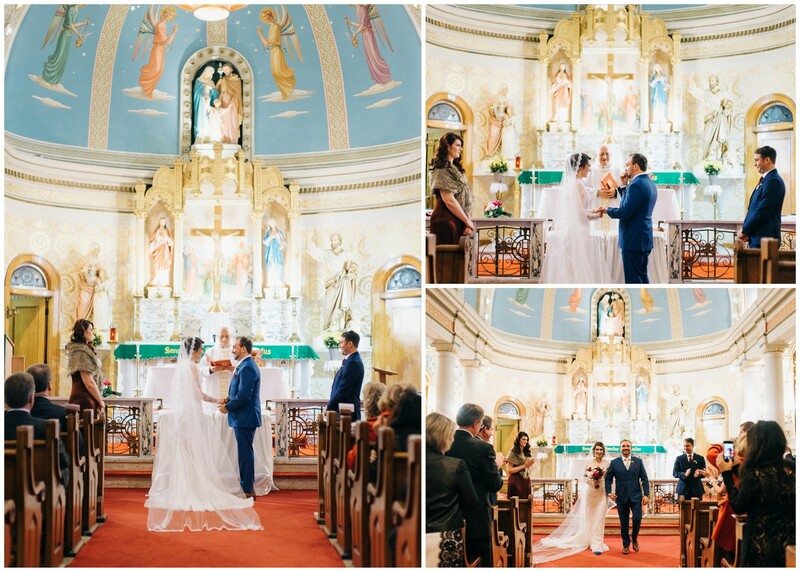 They had more traditional Catholic vows and then ended with the Jewish stomping of the glass at the end of the ceremony. 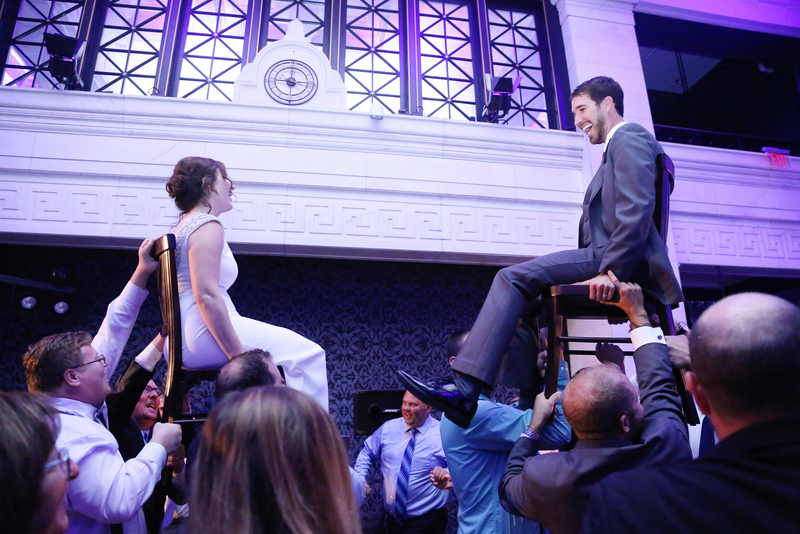 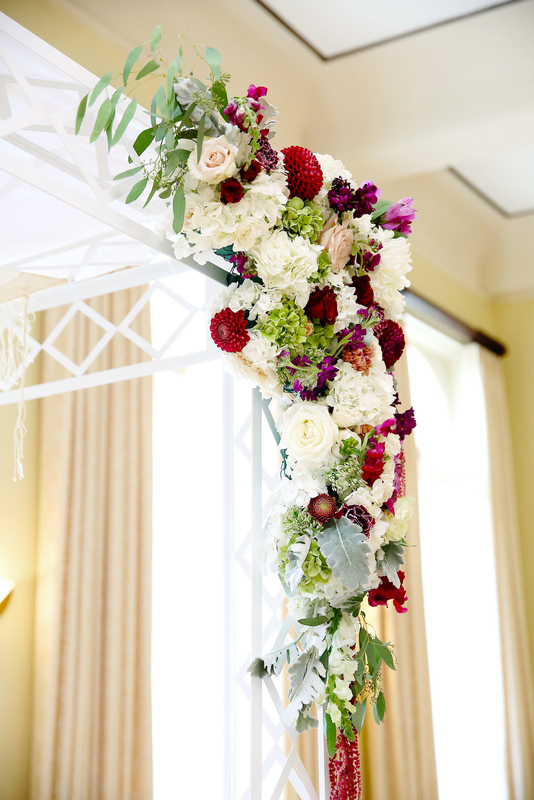 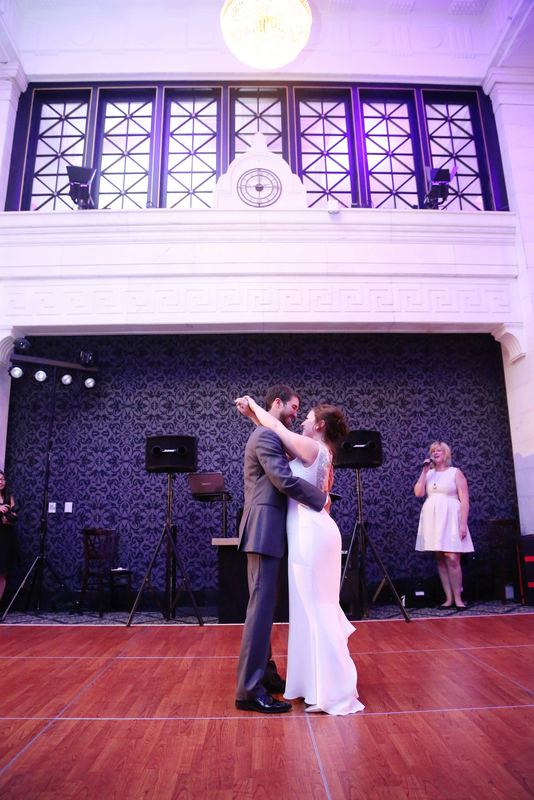 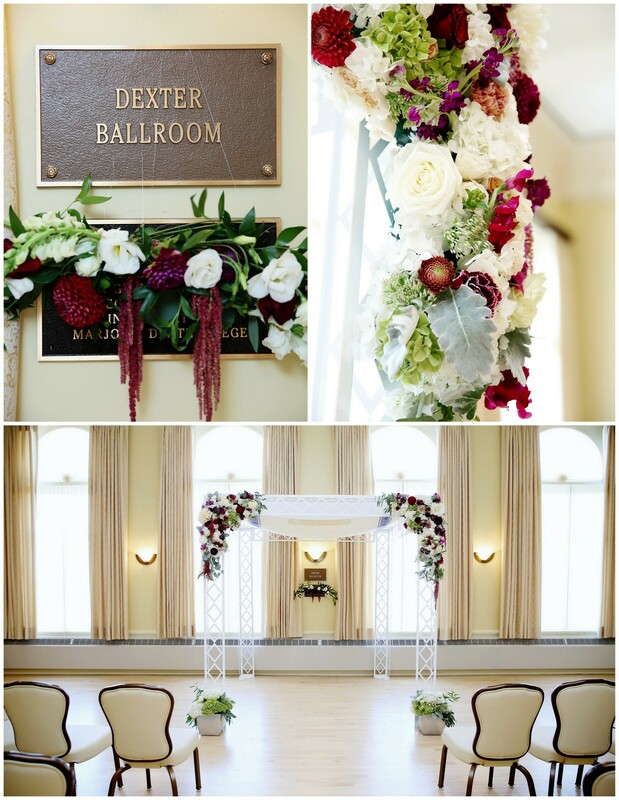 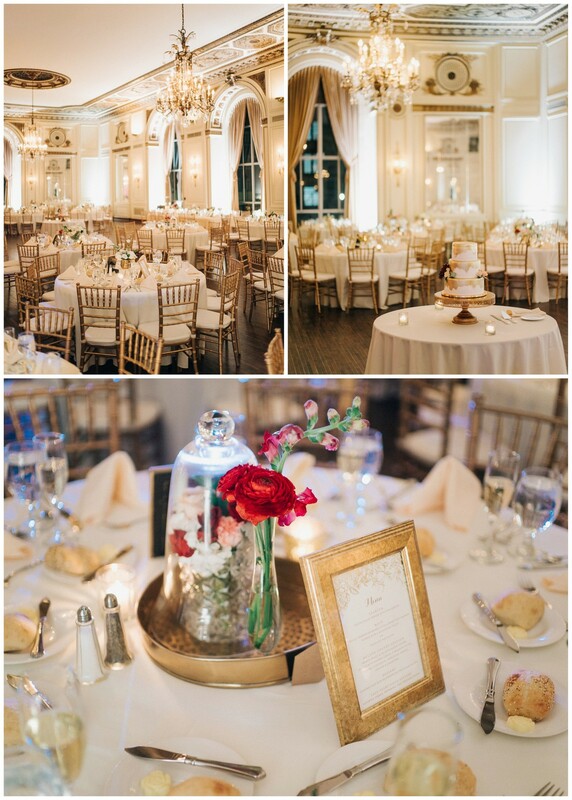 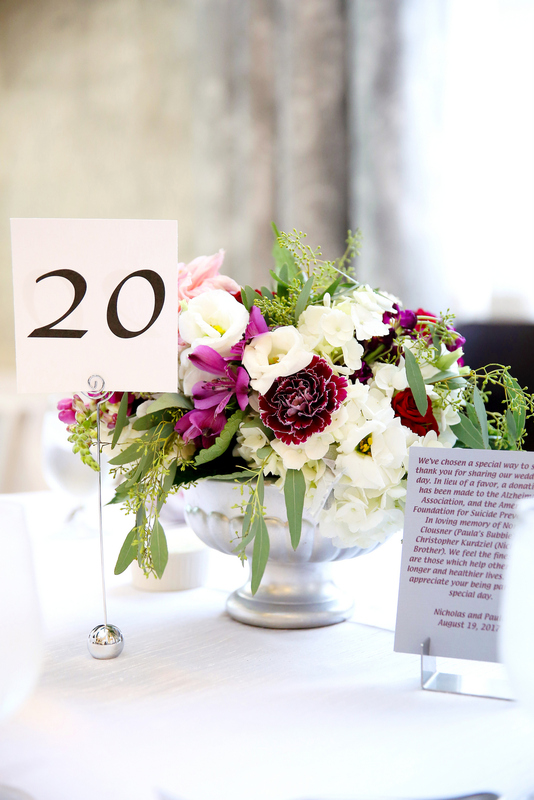 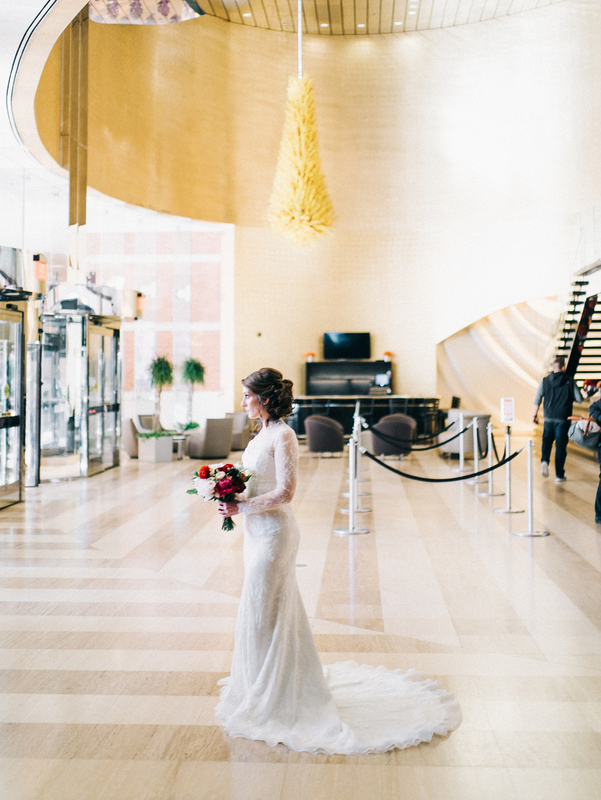 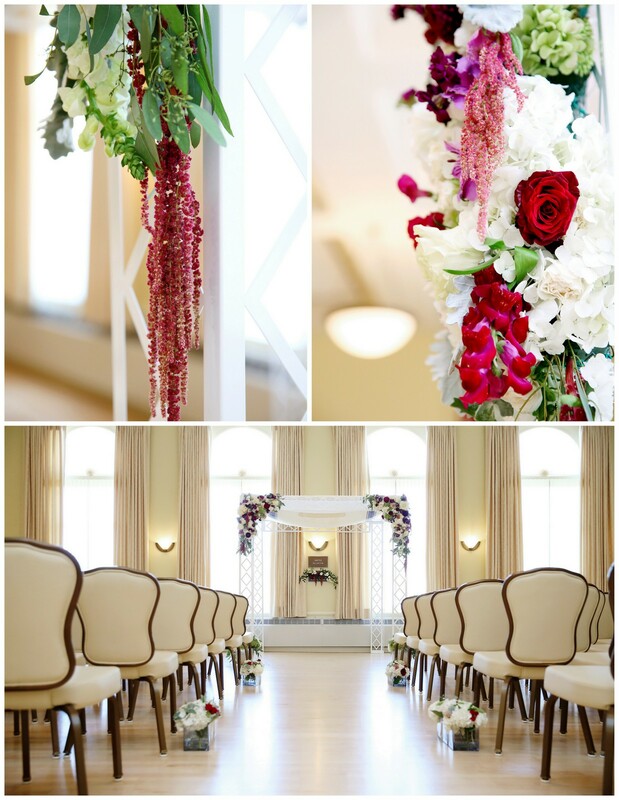 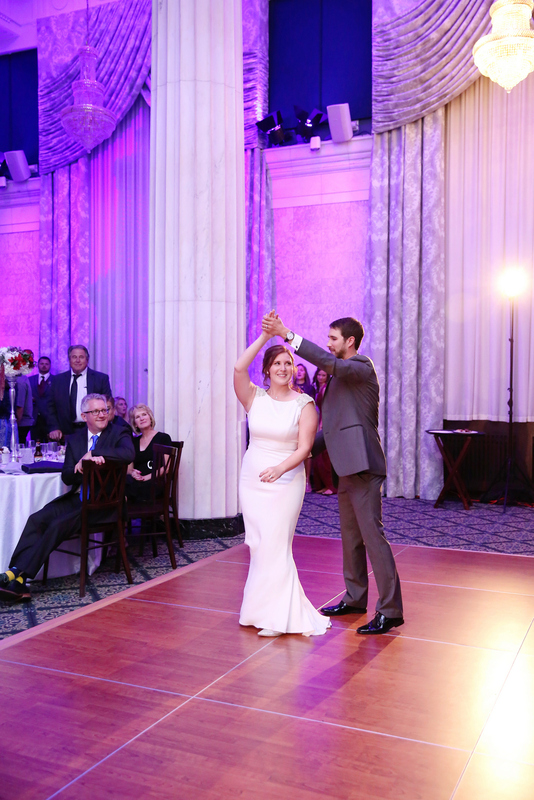 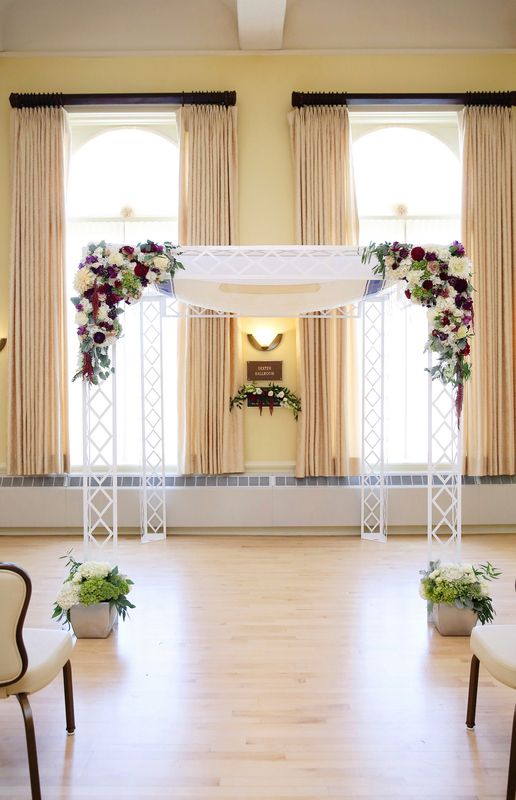 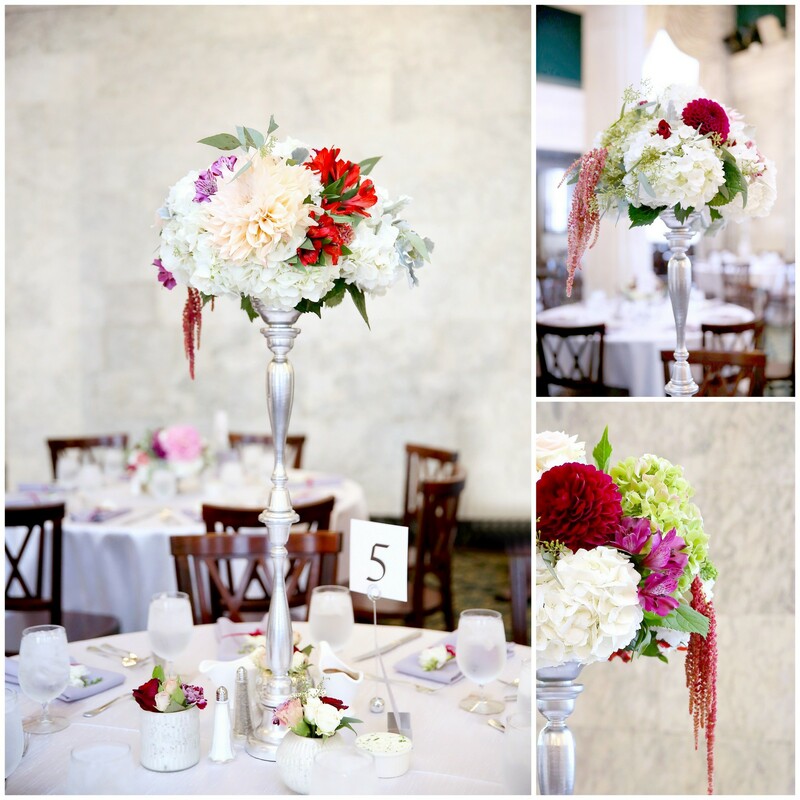 With the tall ceilings at McKay Ballroom, we incorporated tall arrangements to really fill the space. 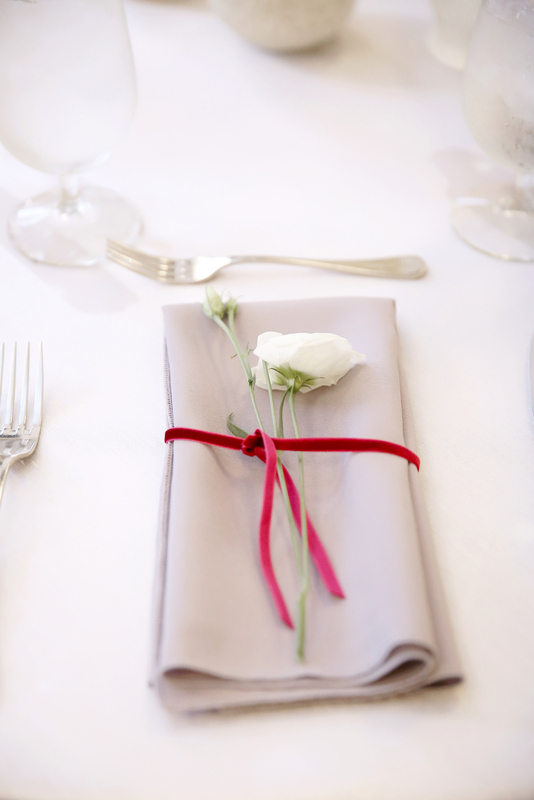 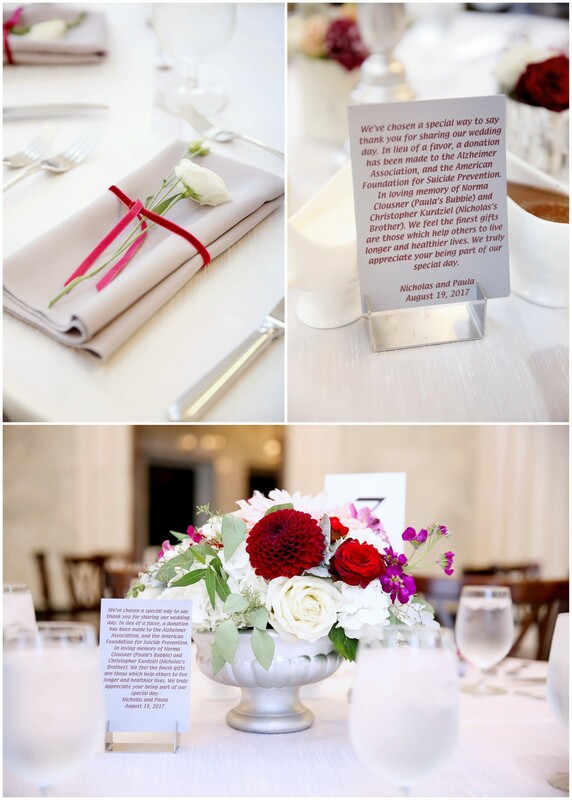 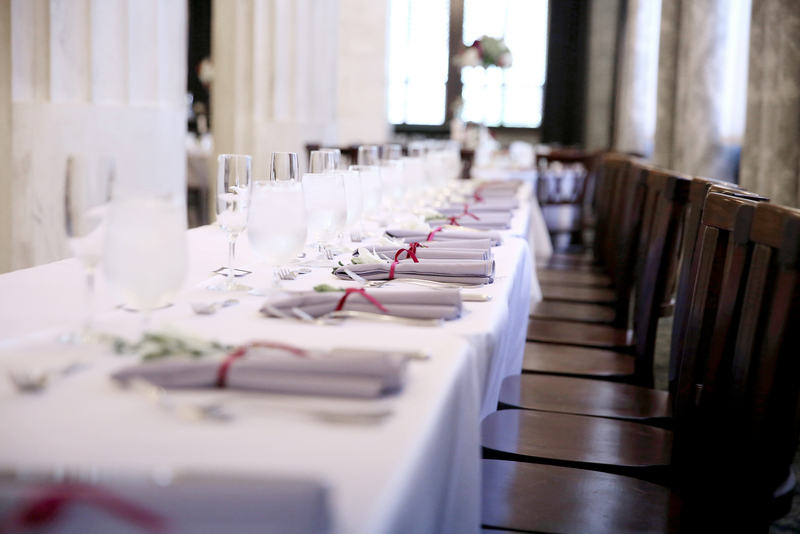 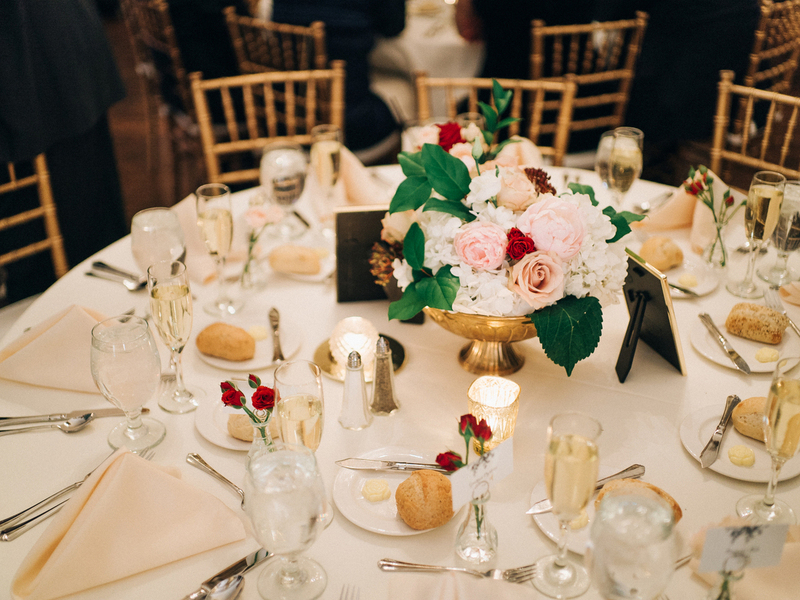 The white dupioni linens set the stage for the tablescapes and all the small details like the burgundy velvet ribbons and white blooms that were placed at every place setting. 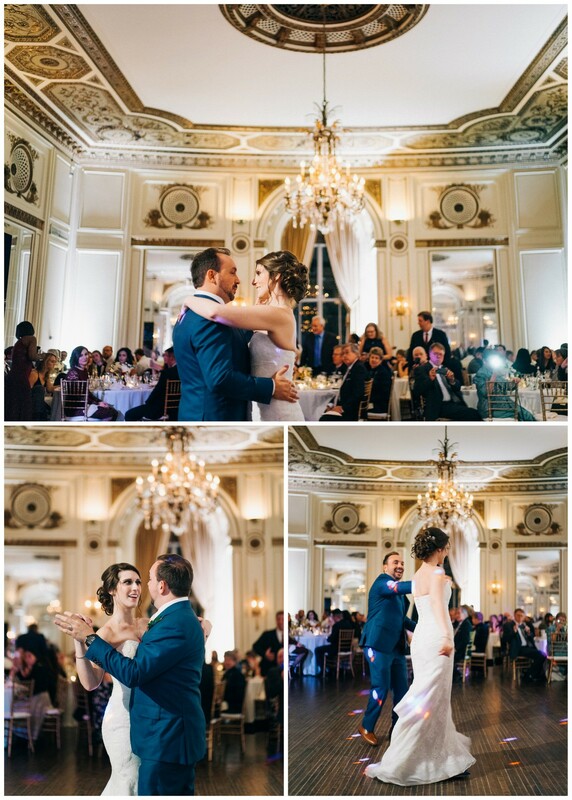 The evening was filled with a memorable Father of the Bride speech, Paula surprising Nick with a soloist to serenade their first dance, and the hora. 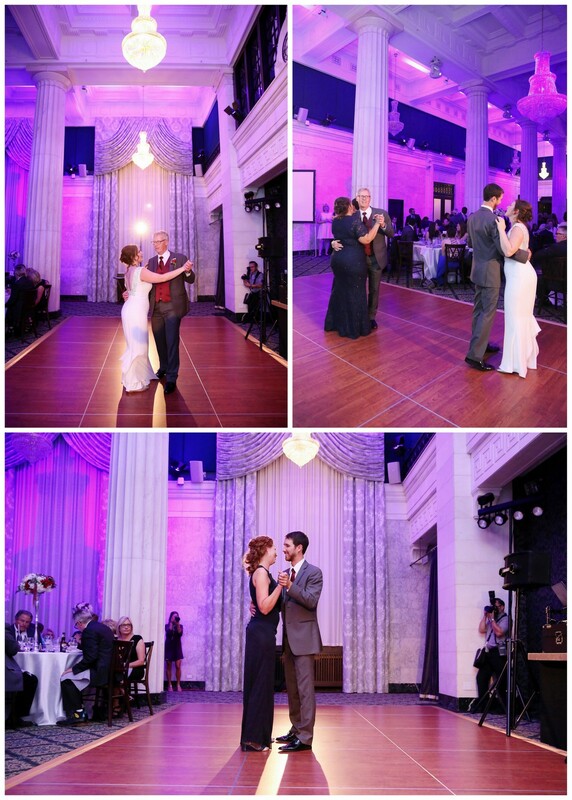 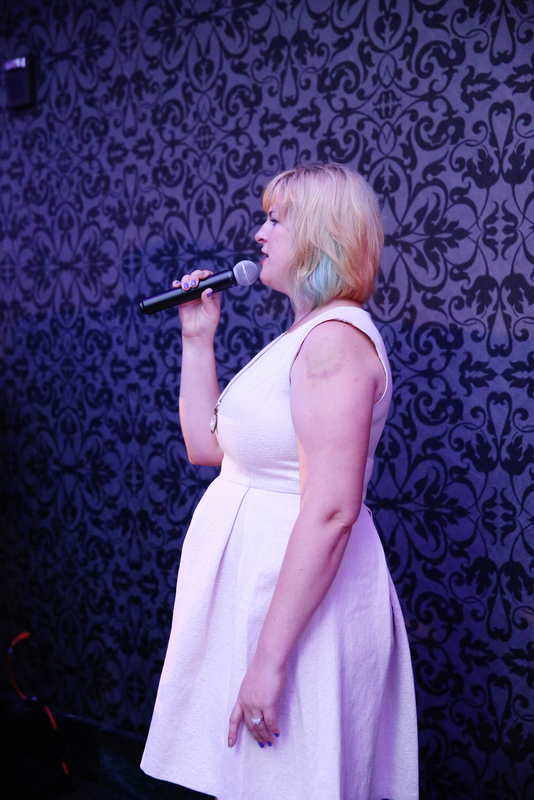 It was truly a wonderful celebration and I loved being a part of it. 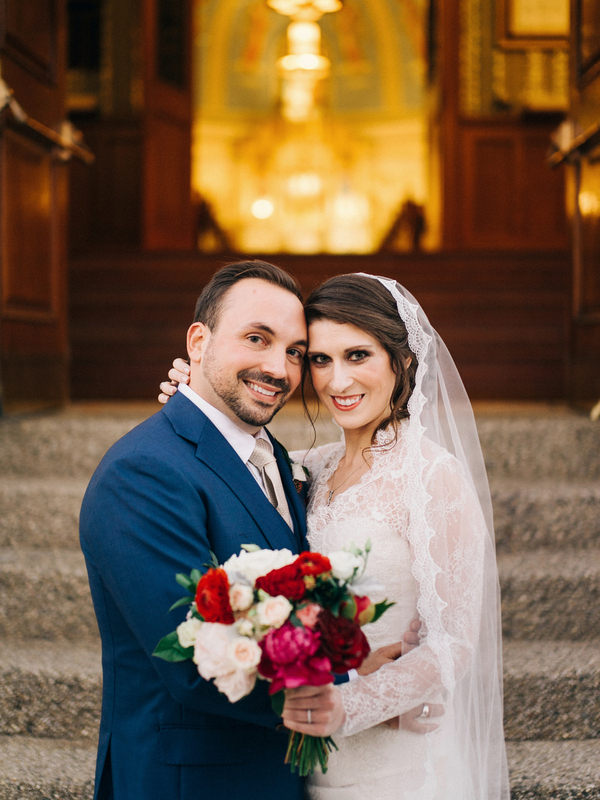 Congratulations to Paula and Nick! 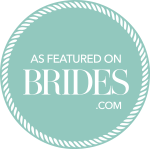 People always find it fun that I stay in touch with a lot of my past brides. 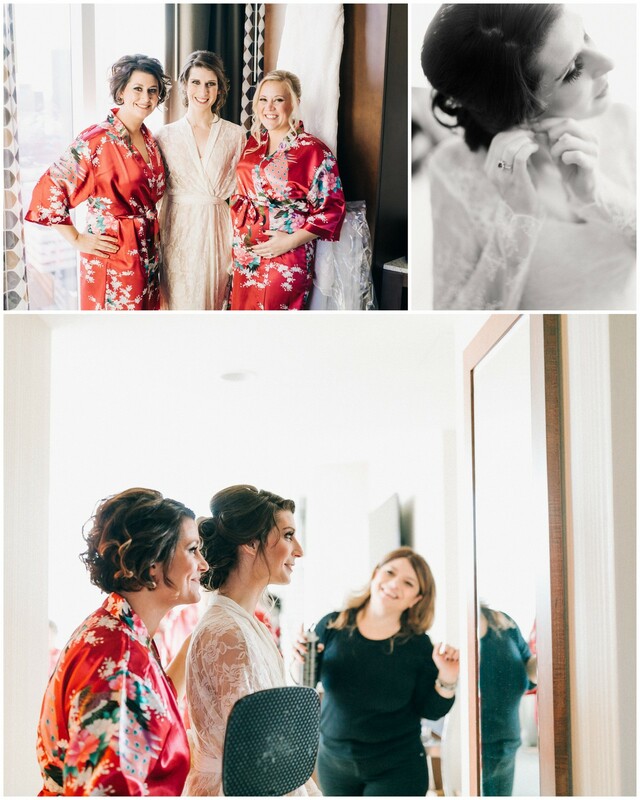 But the truth is, these brides and I have spent countless hours together over many months, planning such an important day, that it only seems natural to stay in touch. 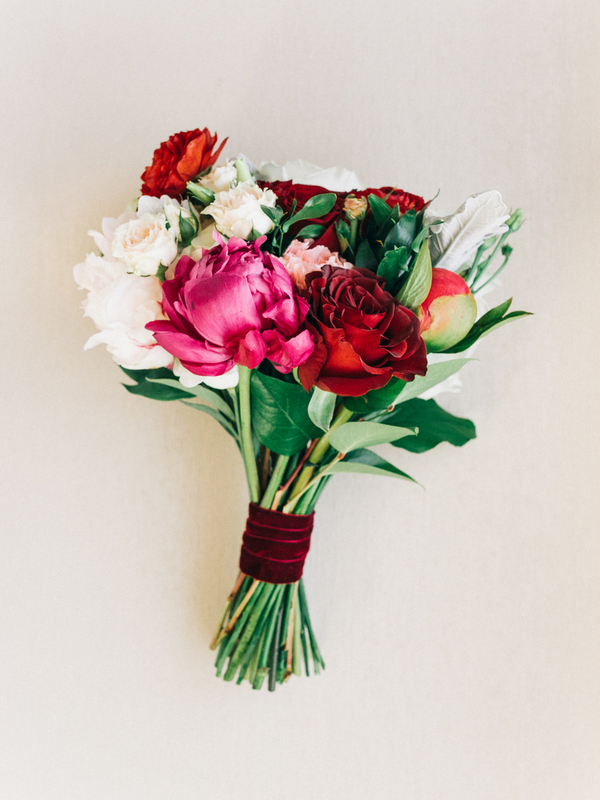 And with every referral, birth announcement or impromptu coffee date that comes my way, it’s just a small reminder to me that what I do matters. 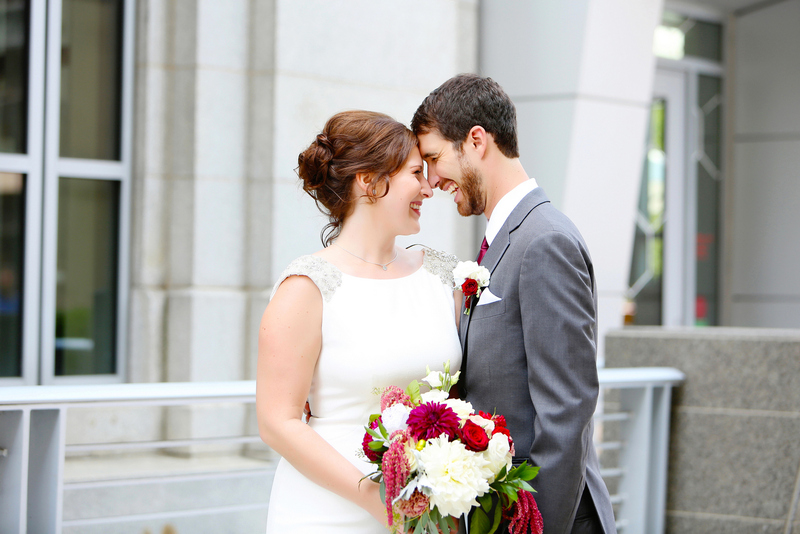 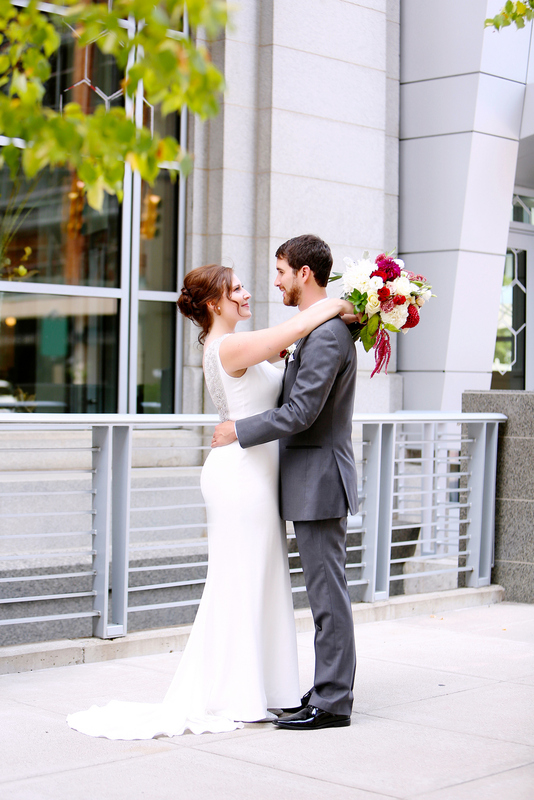 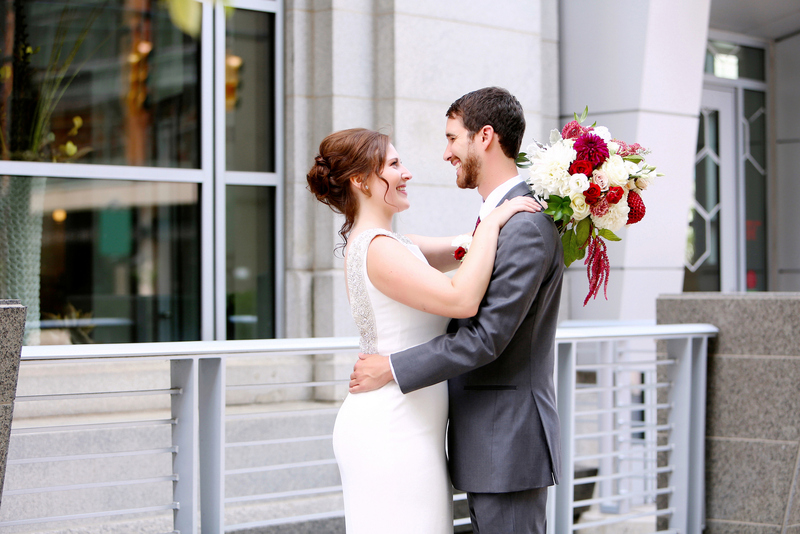 Cue Katherine, a past bride of mine and now a small business owner (x2). 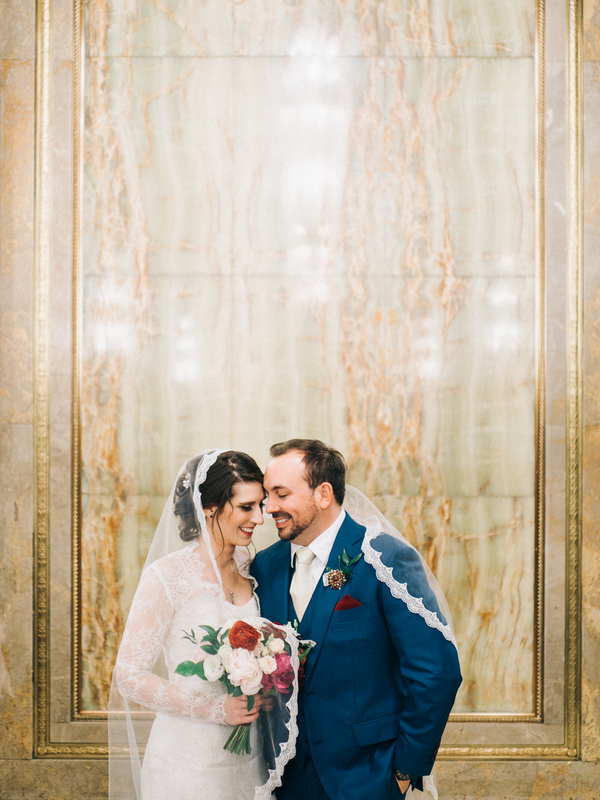 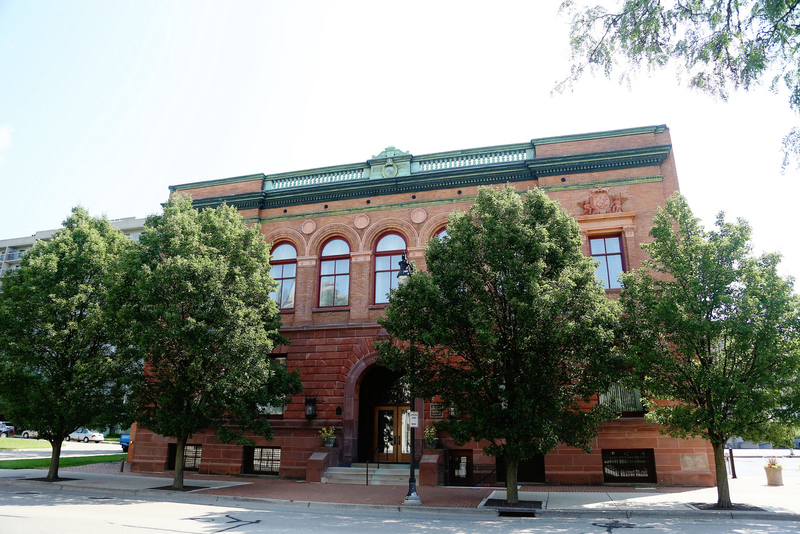 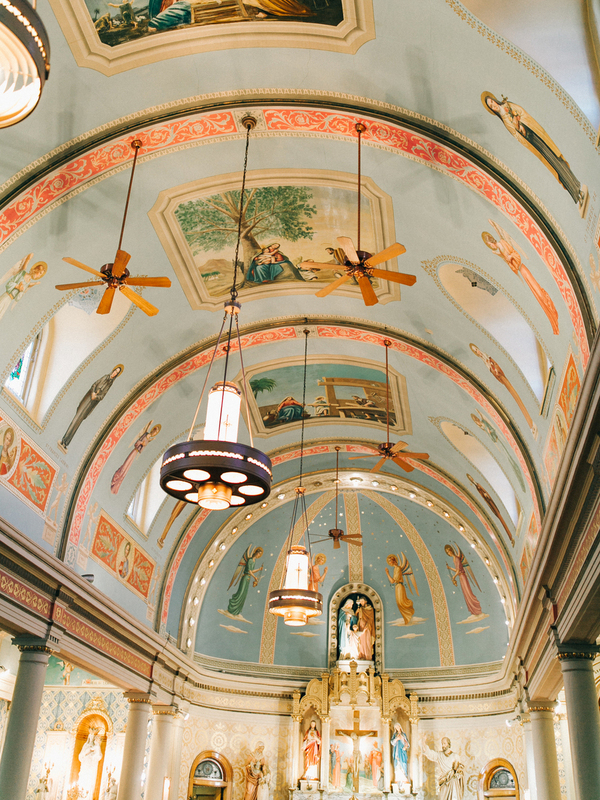 She and her husband live in the most beautiful home, on the east side of the state, that they are restoring and where she also runs her interior design business from. 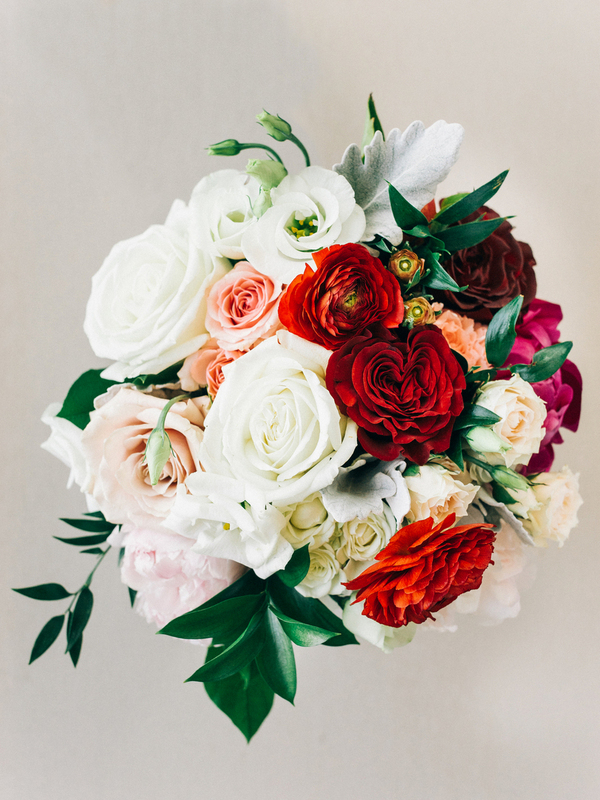 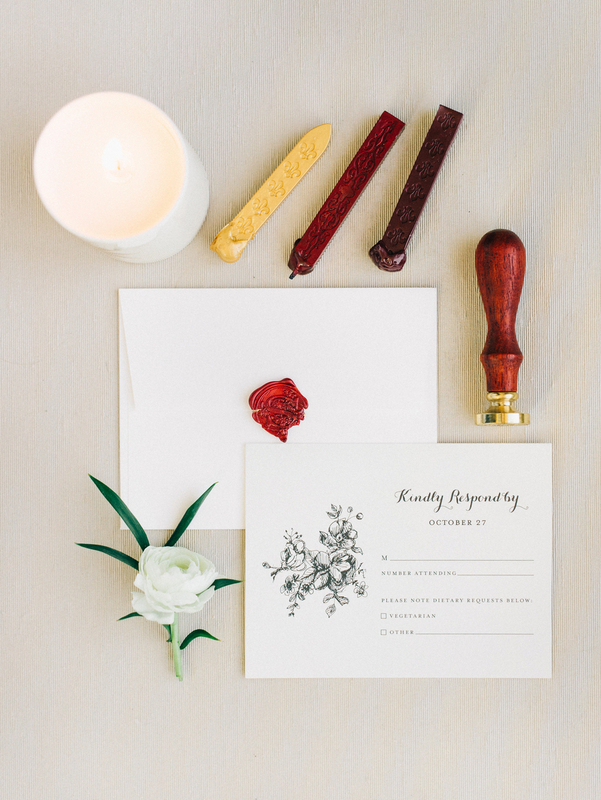 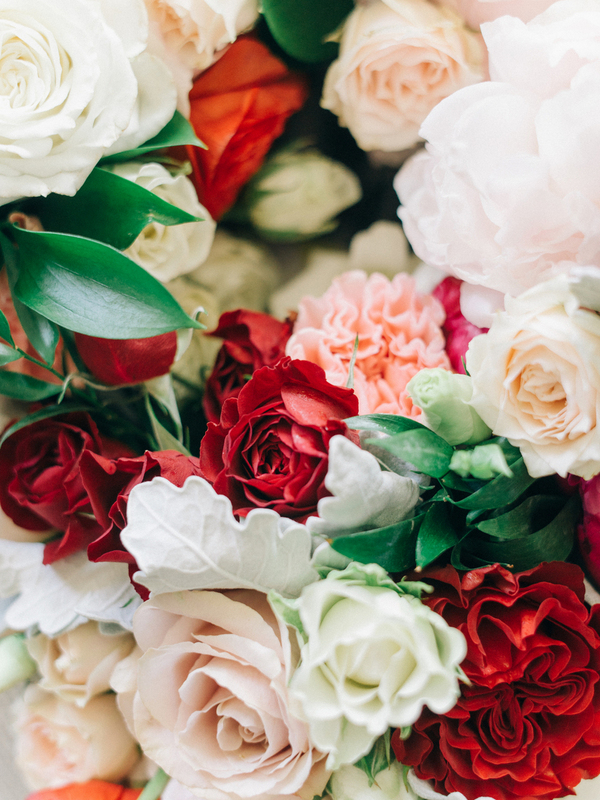 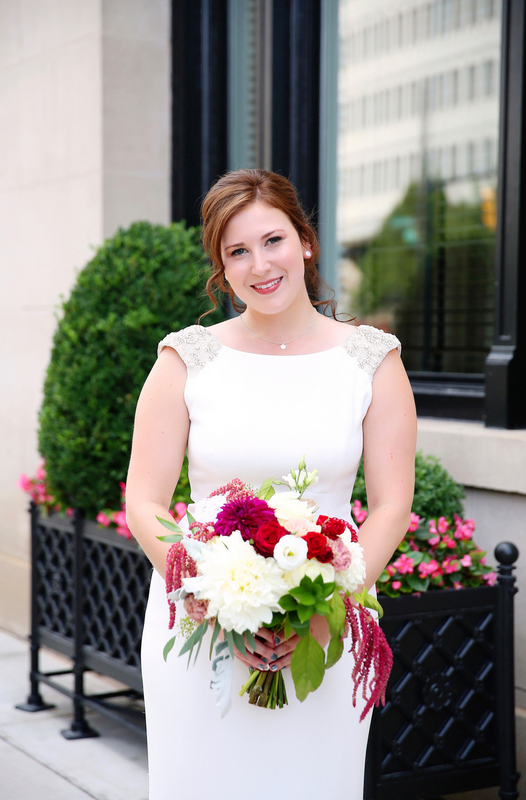 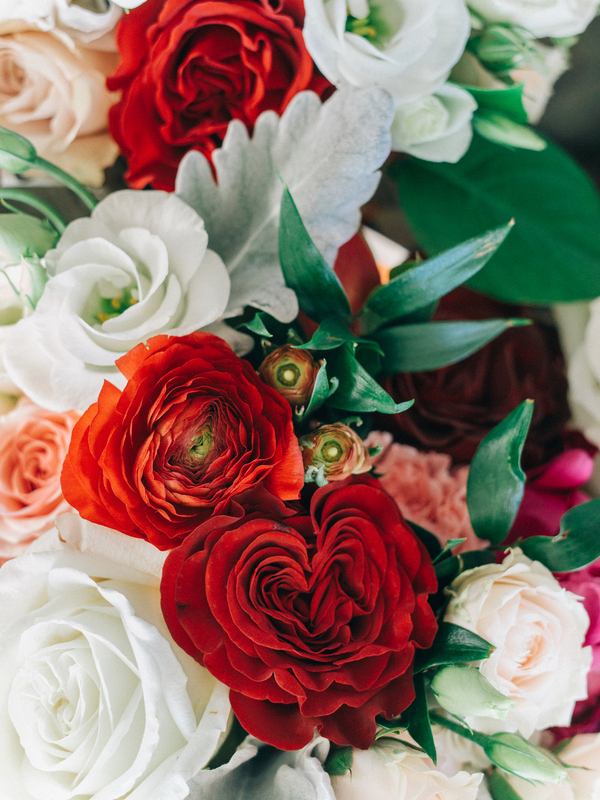 When I received an email from Katherine wanting me to be the floral designer for one of her clients, I was immediately flattered and excited. 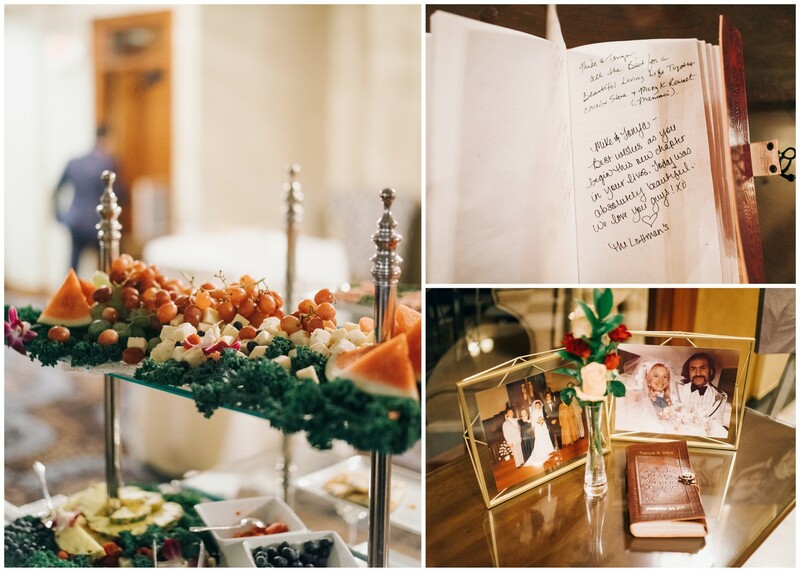 The mood board she sent and the ideas she had put together were amazing. 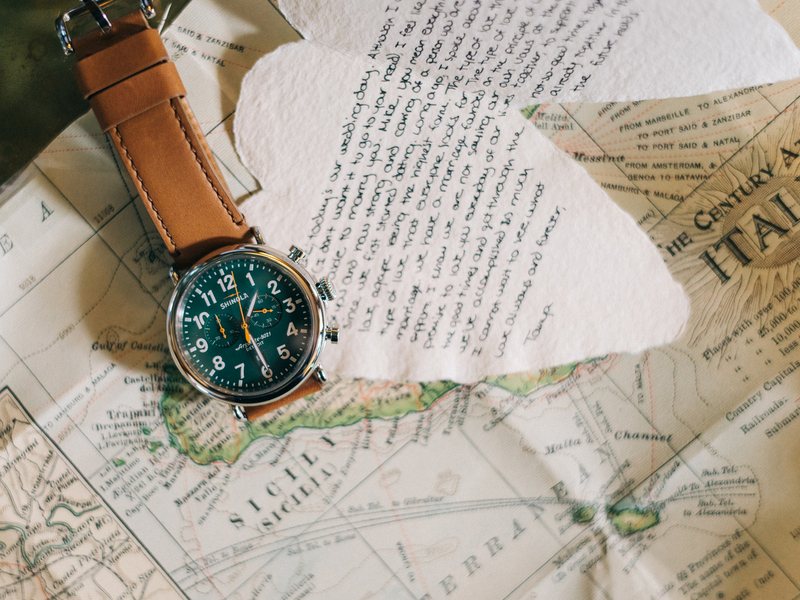 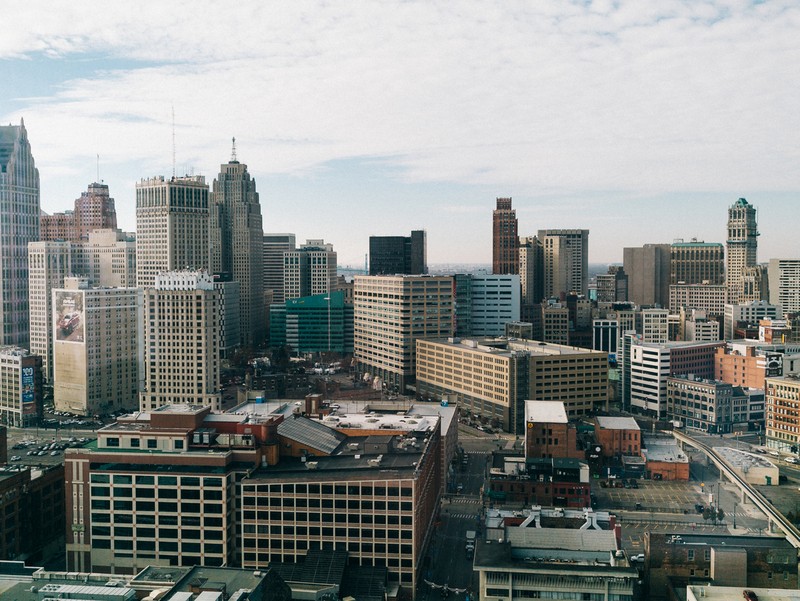 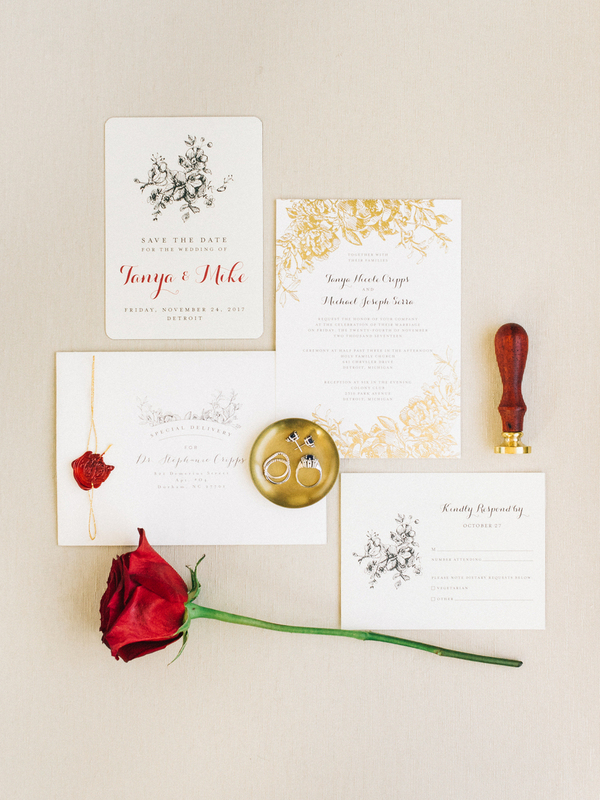 The overall aesthetic could be described as Old World Charm. 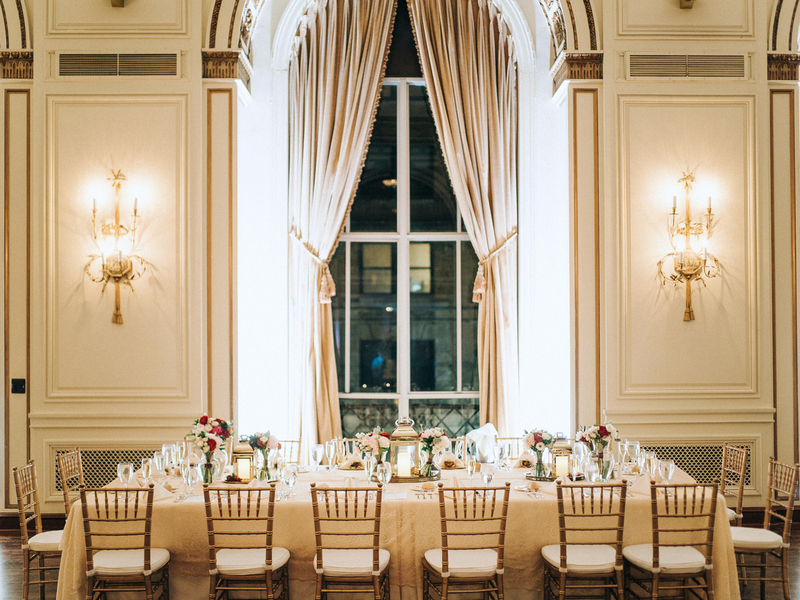 Elegant antiques where accented by a rich color palette. 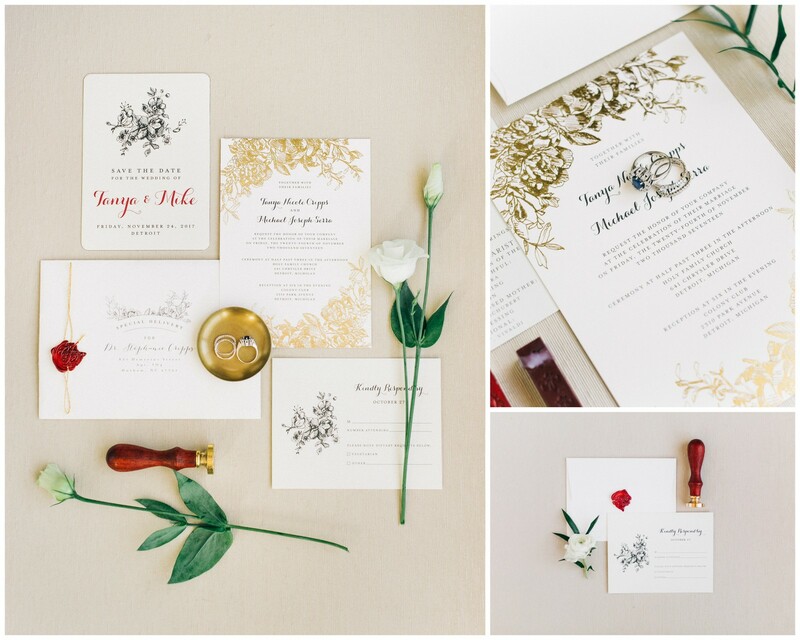 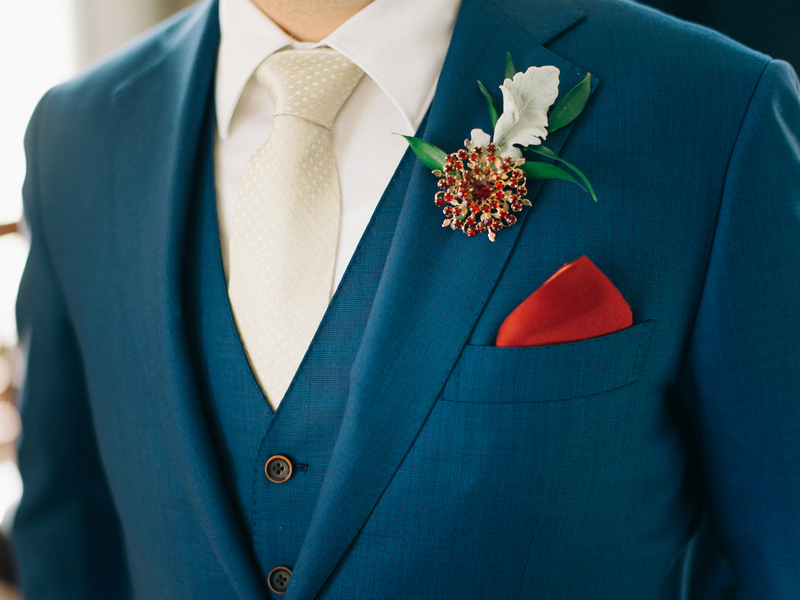 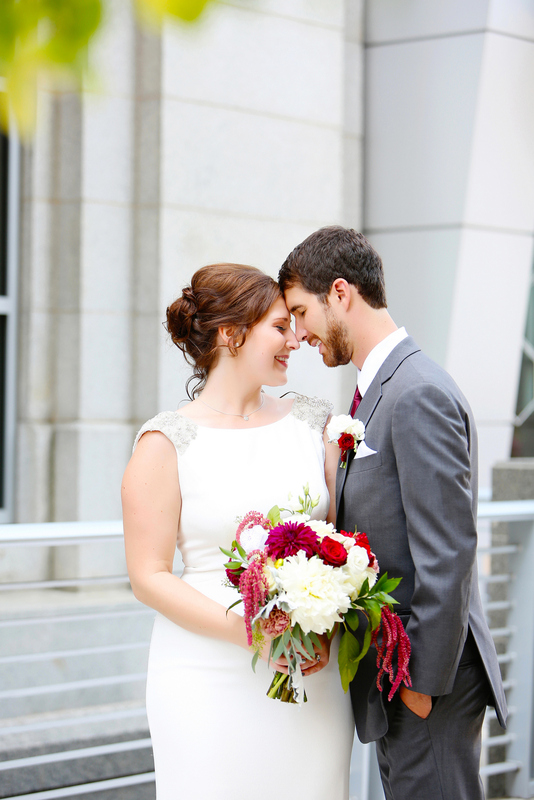 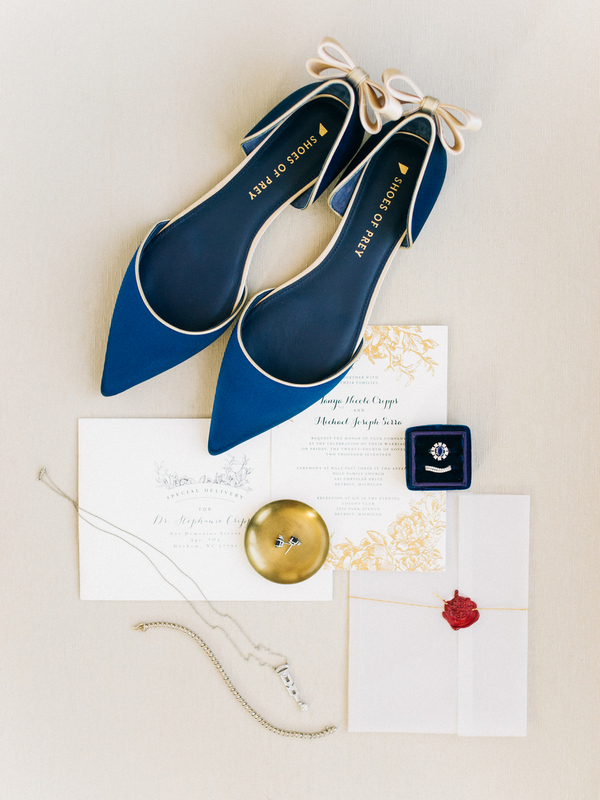 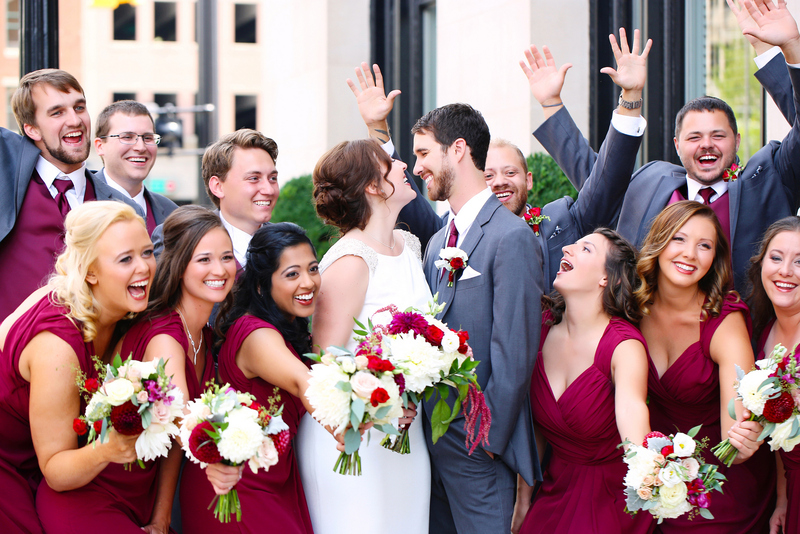 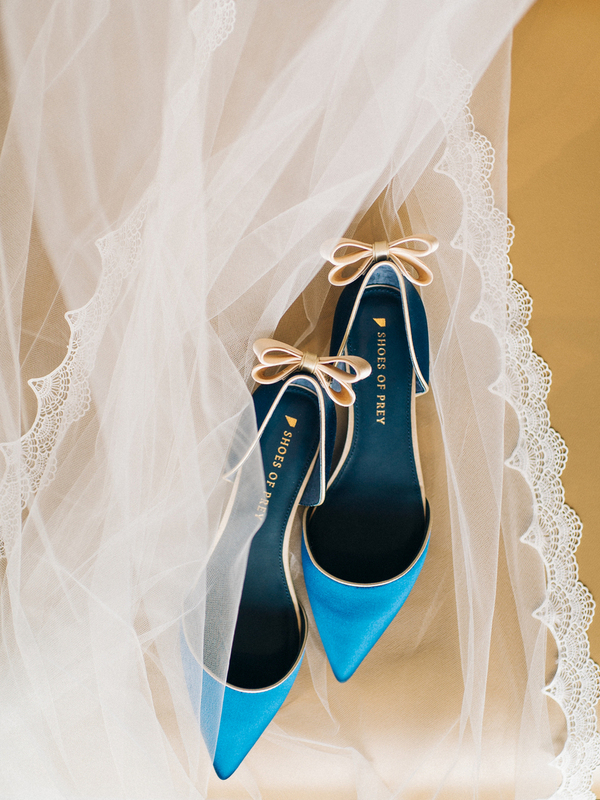 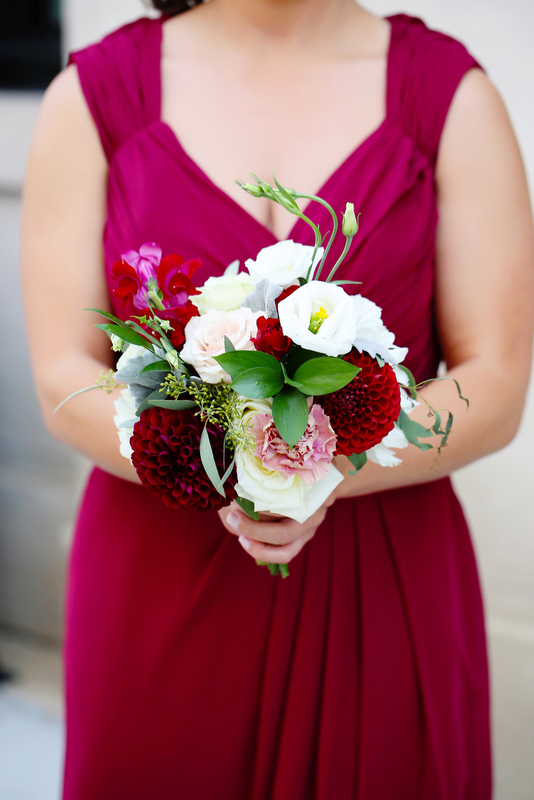 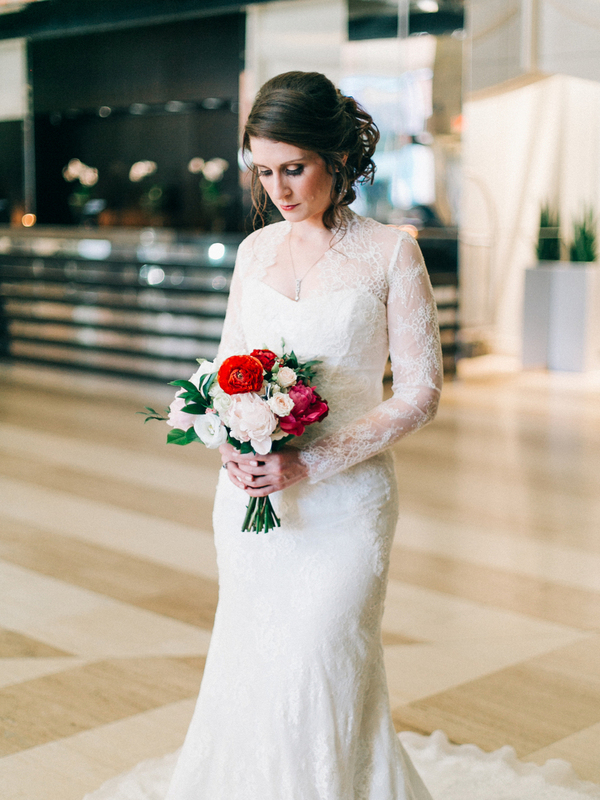 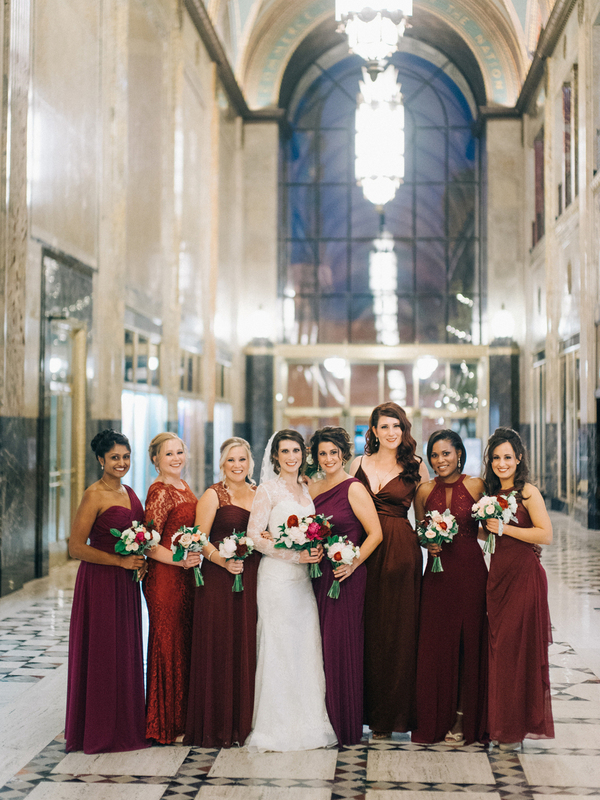 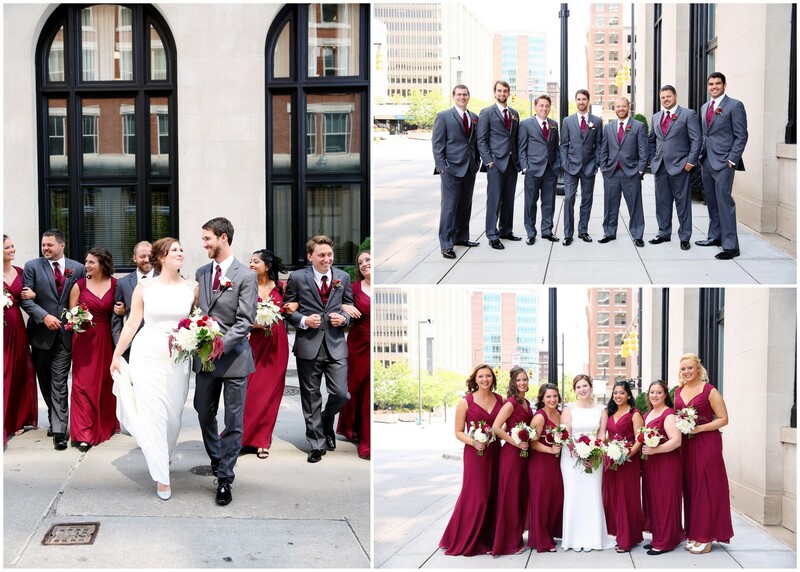 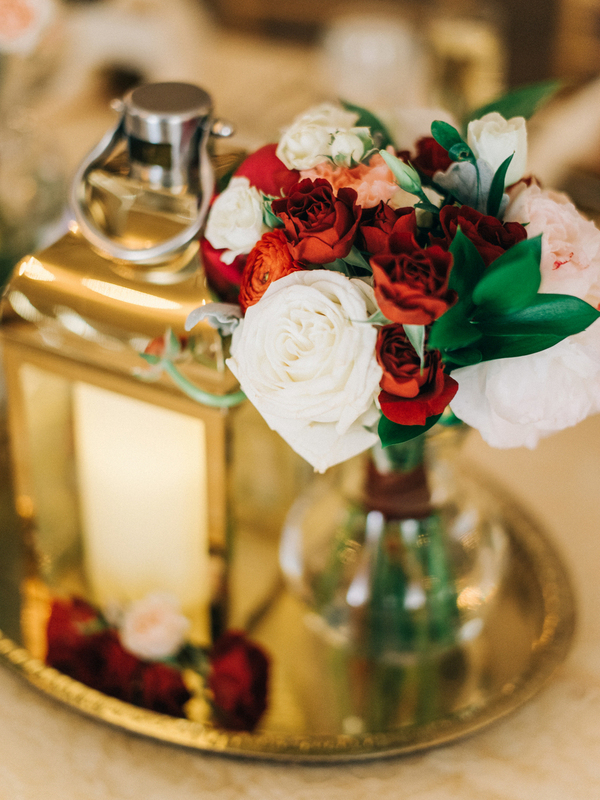 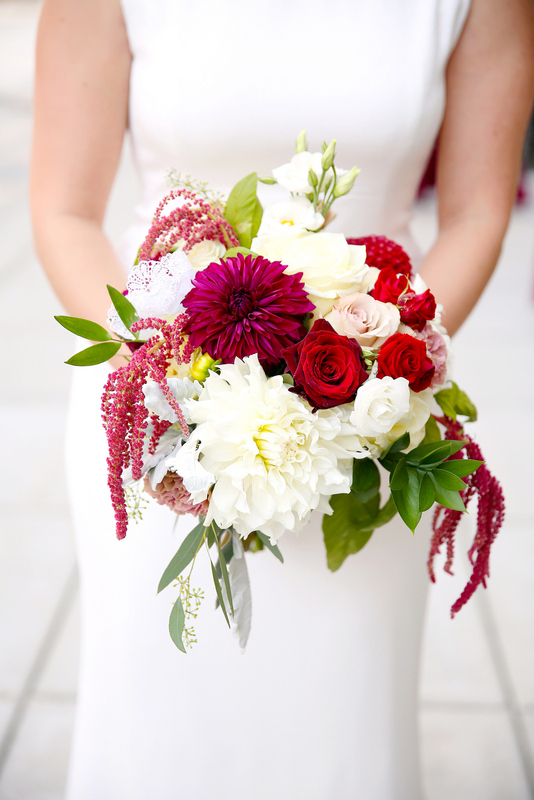 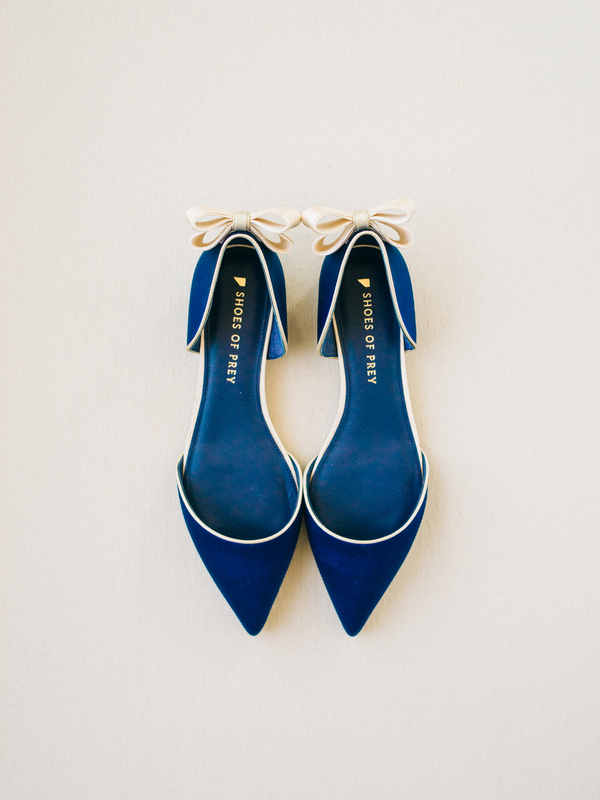 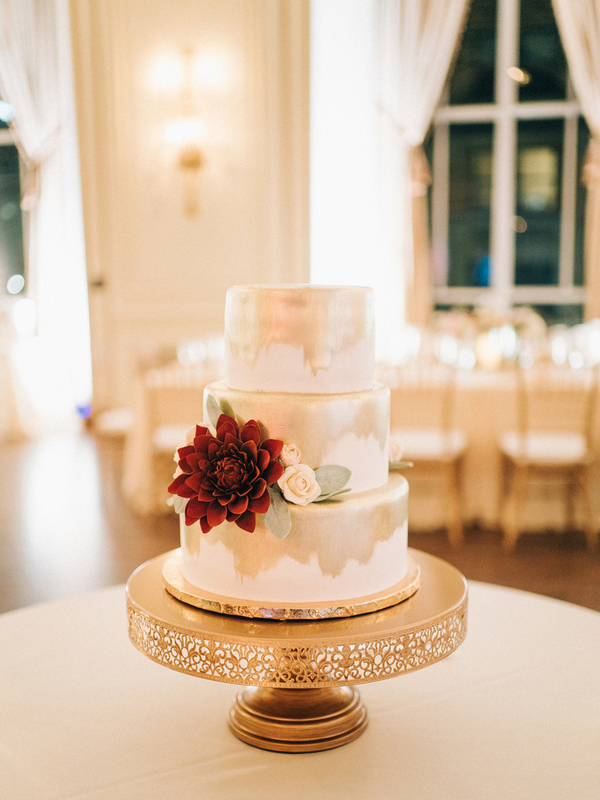 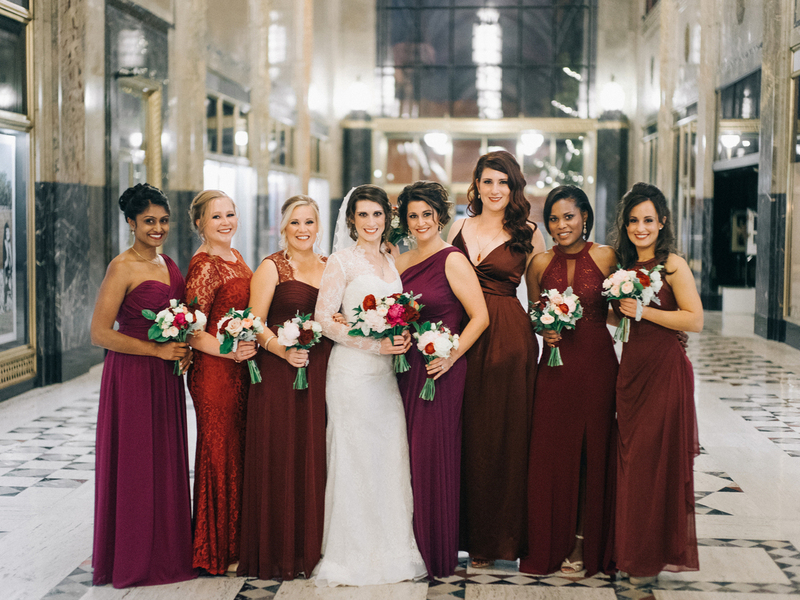 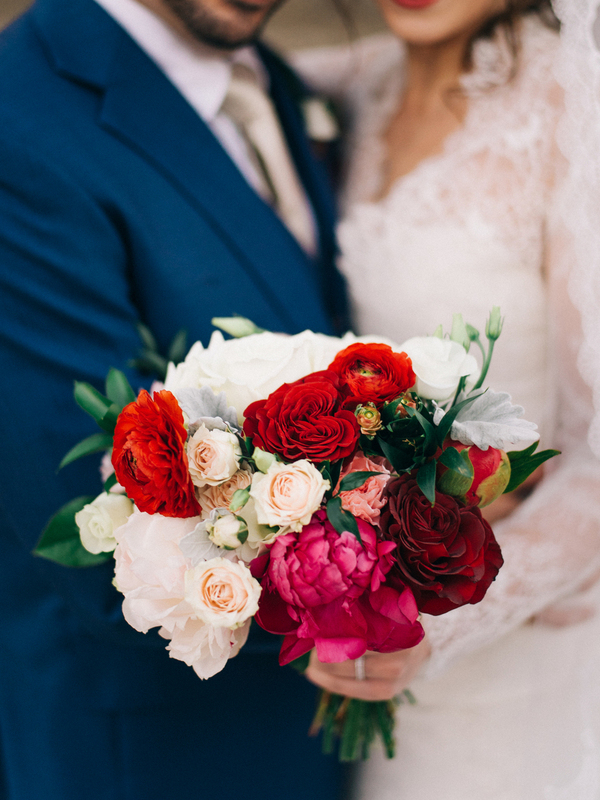 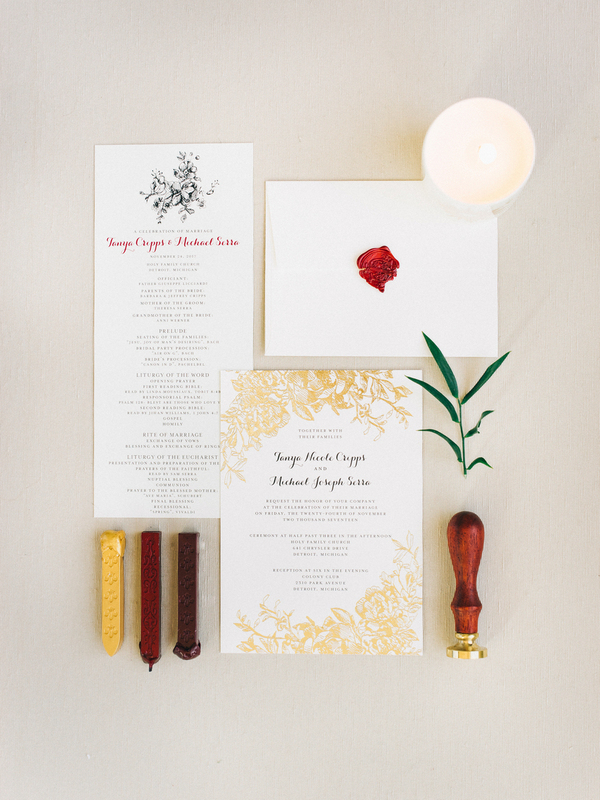 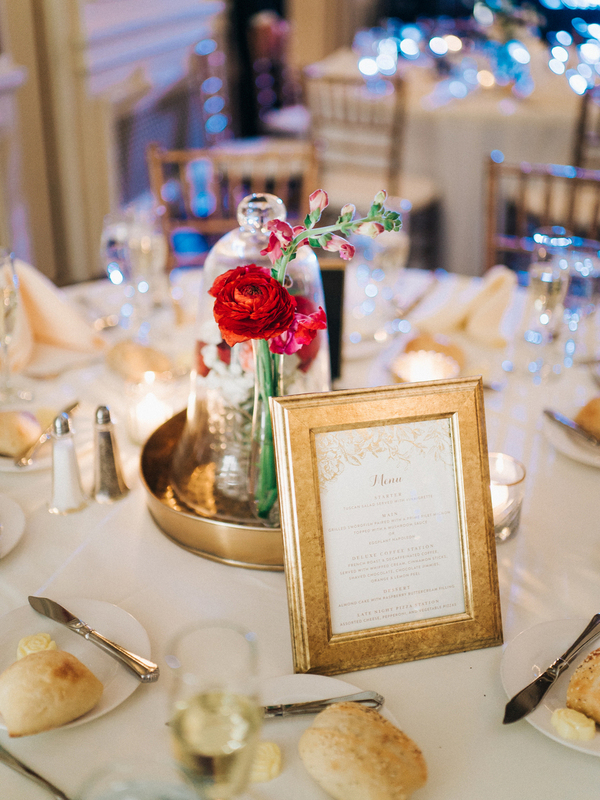 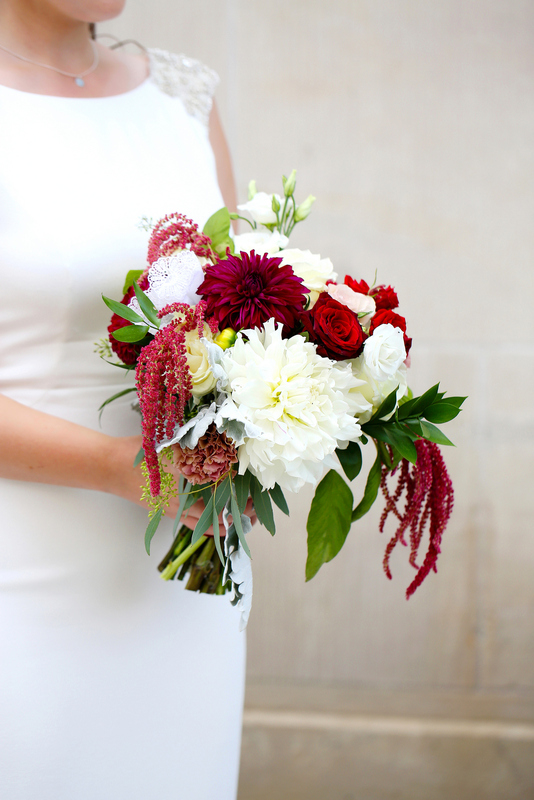 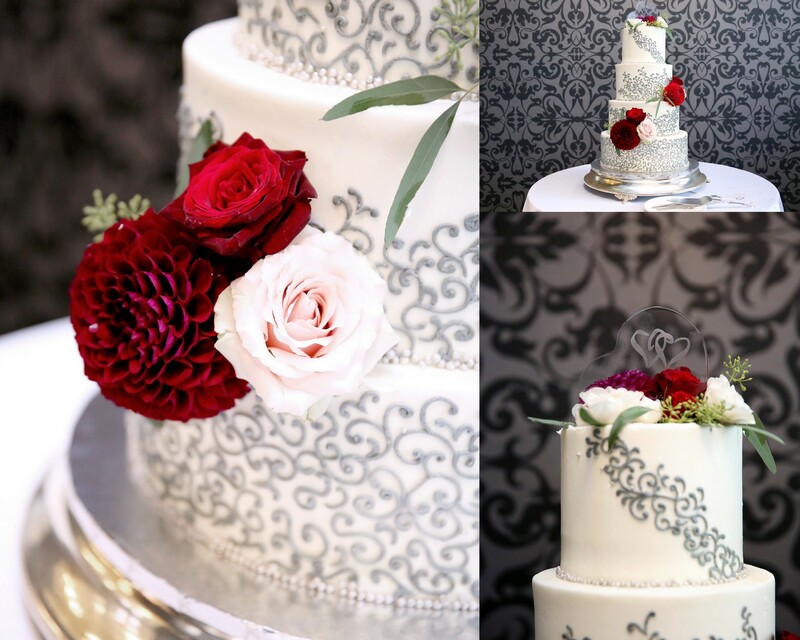 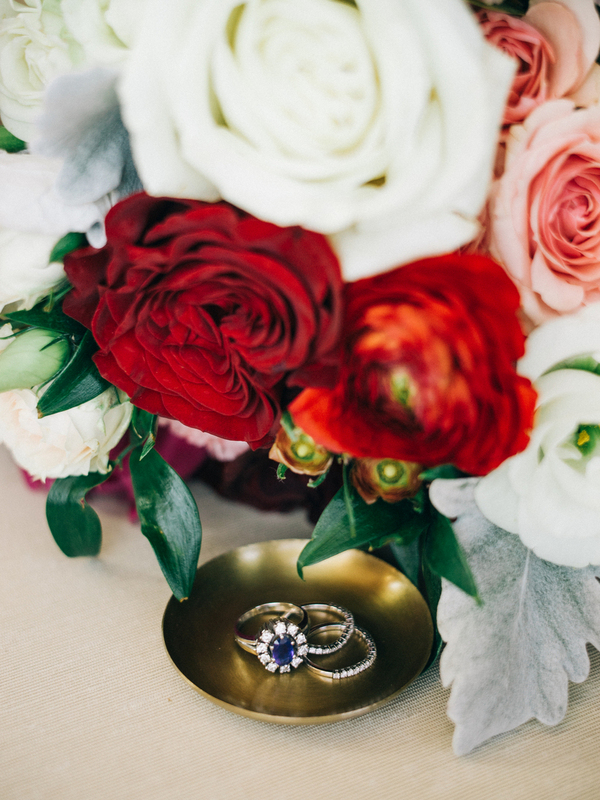 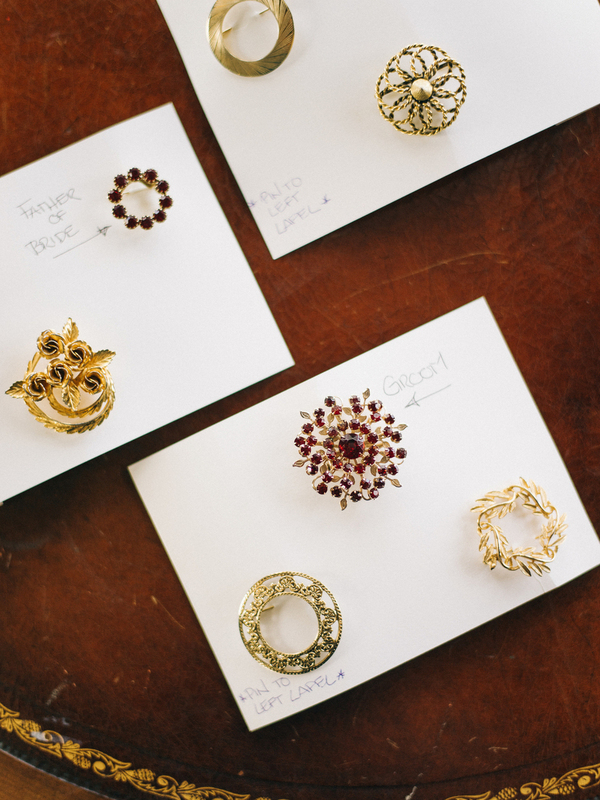 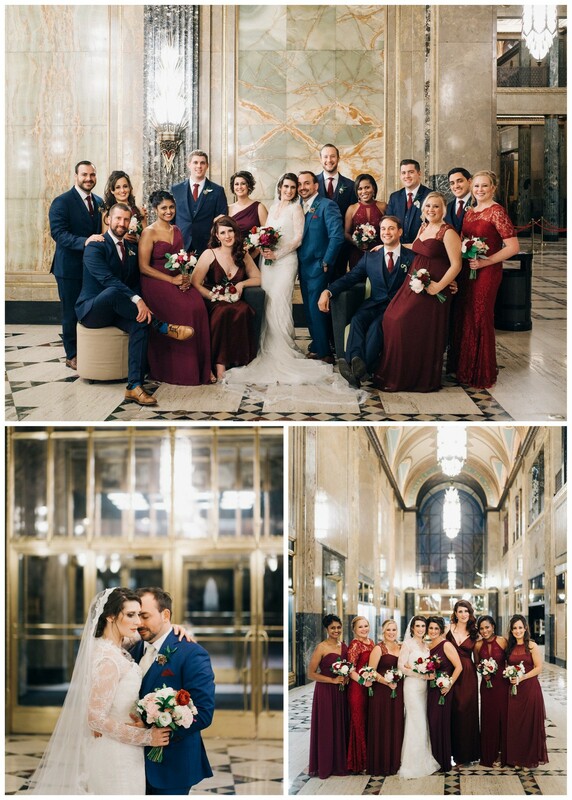 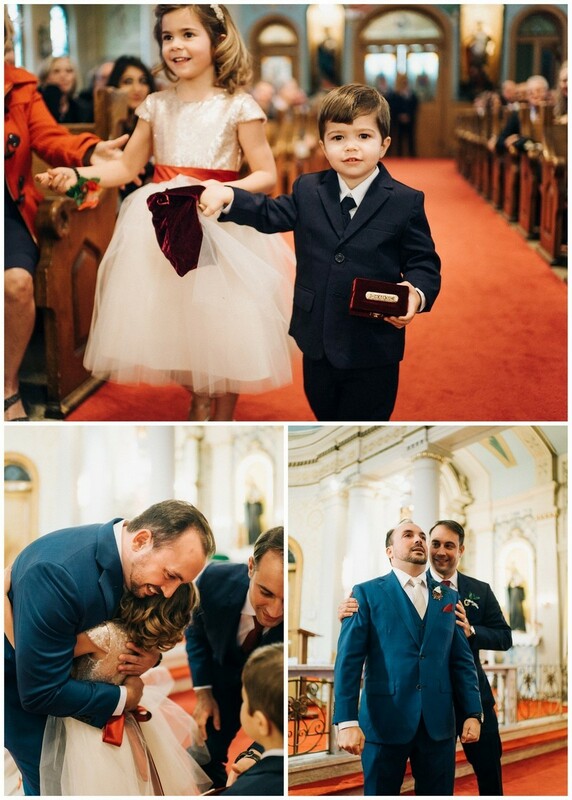 Shades of reds and deep blue were accented with blush and gold. 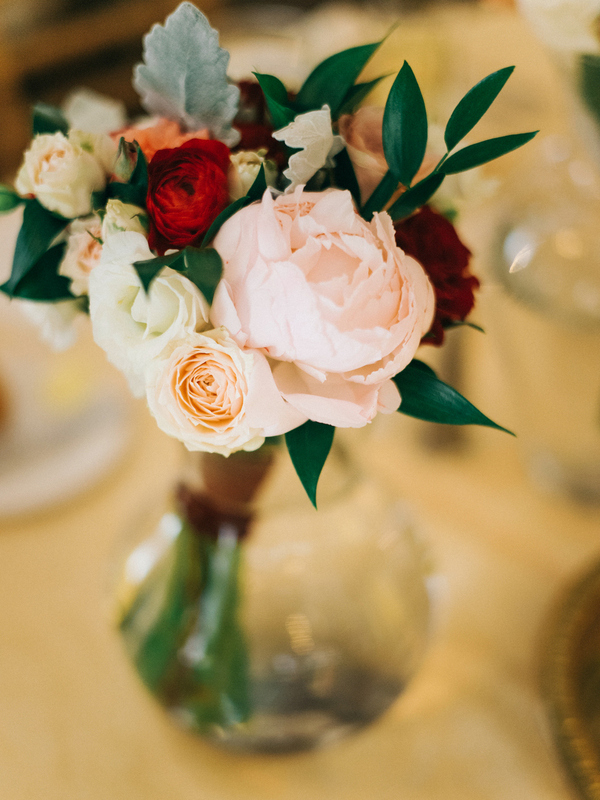 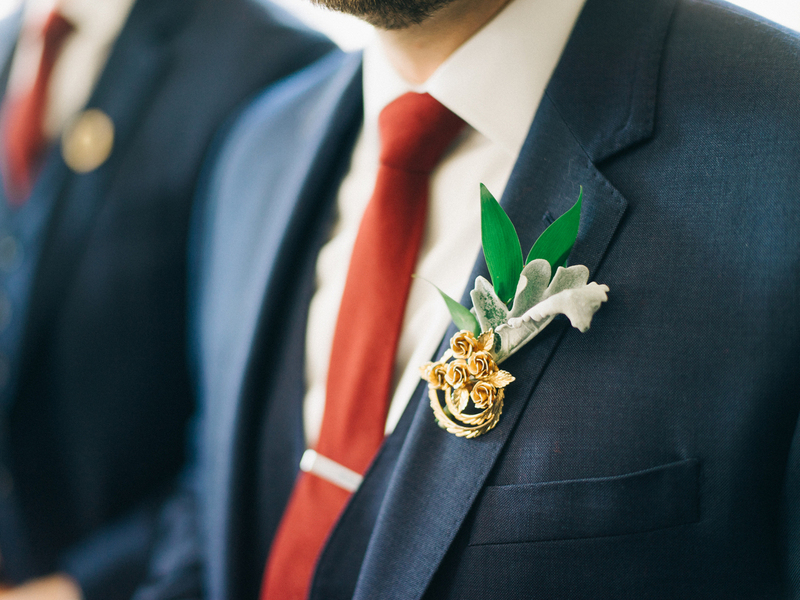 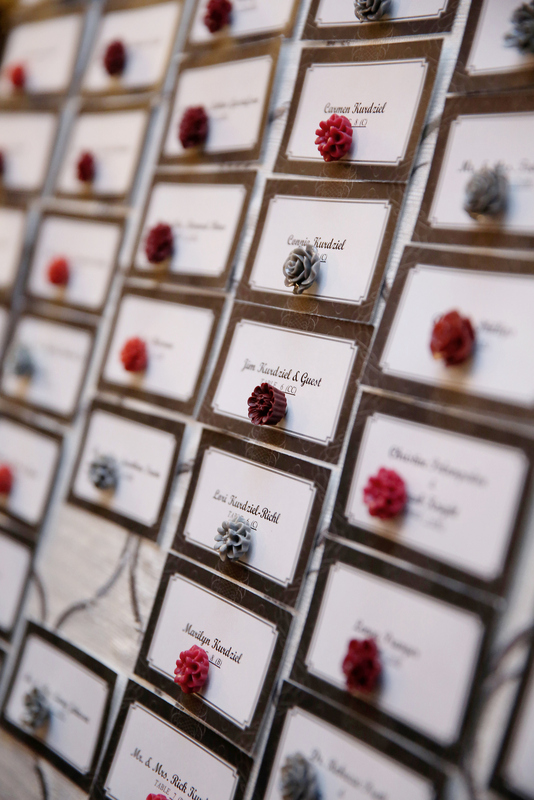 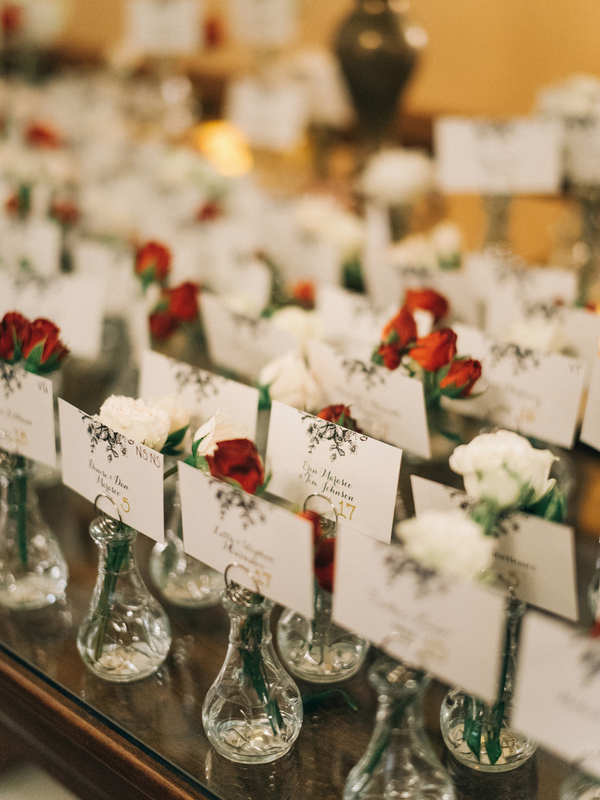 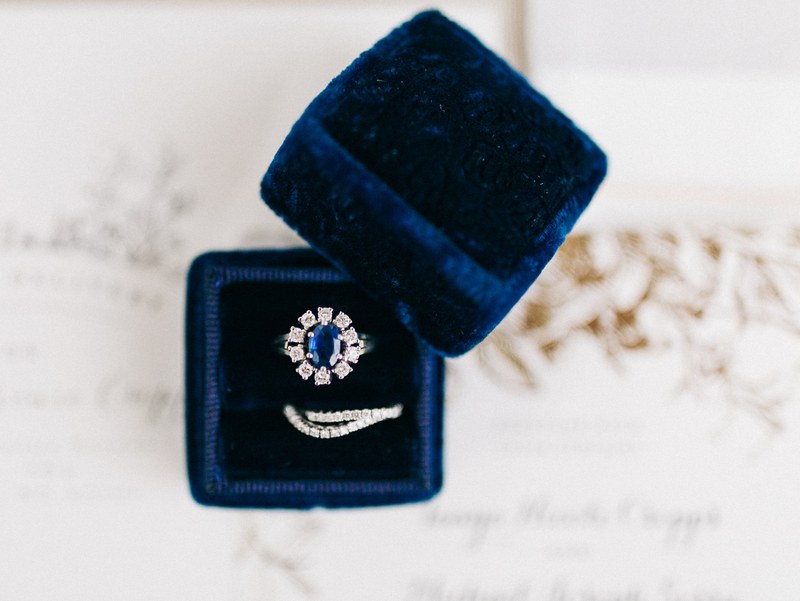 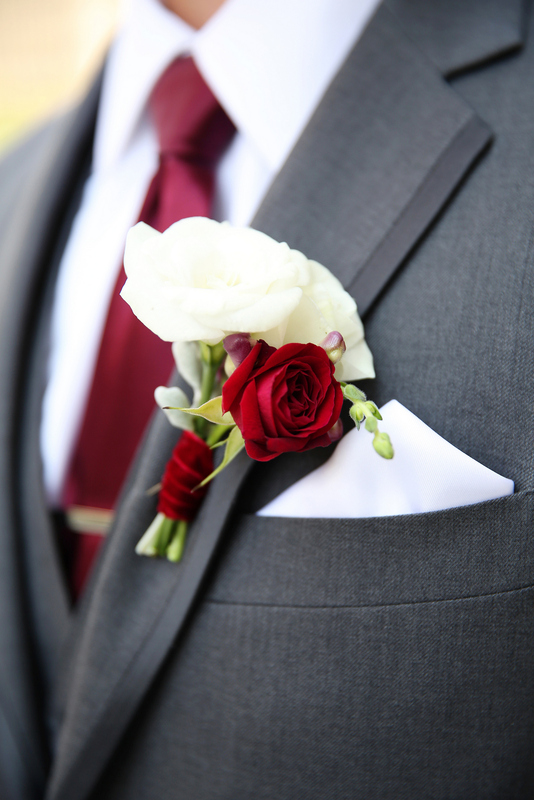 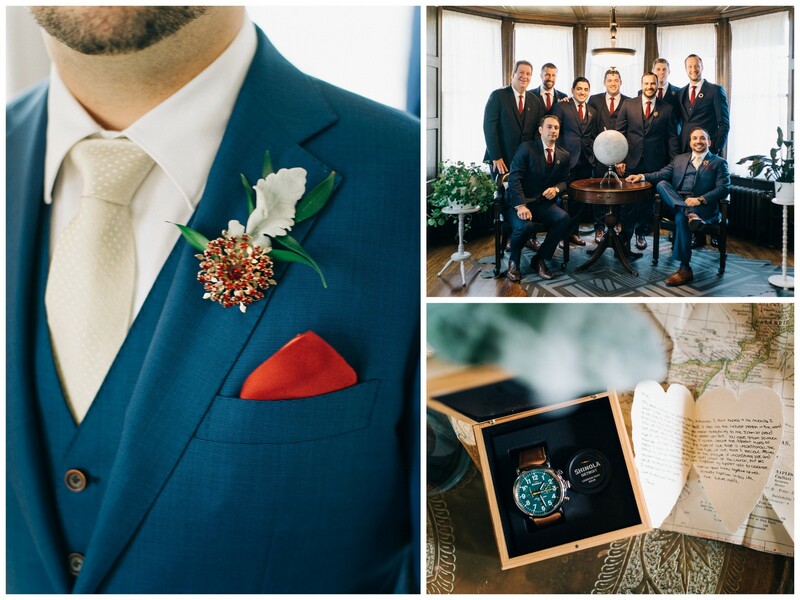 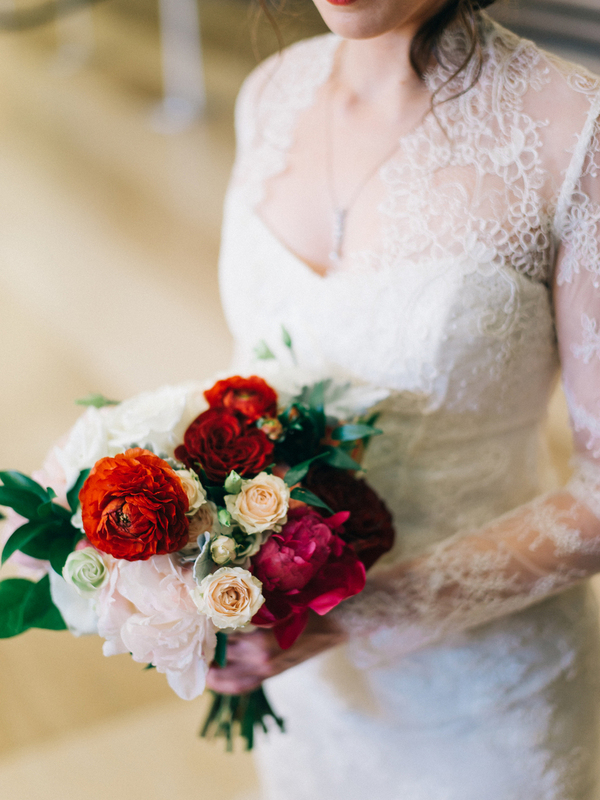 Velvet ribbon was wrapped around the bouquets, which consisted of peonies, ranunculus, and garden roses, and greenery was tucked behind the antique broaches the men wore. 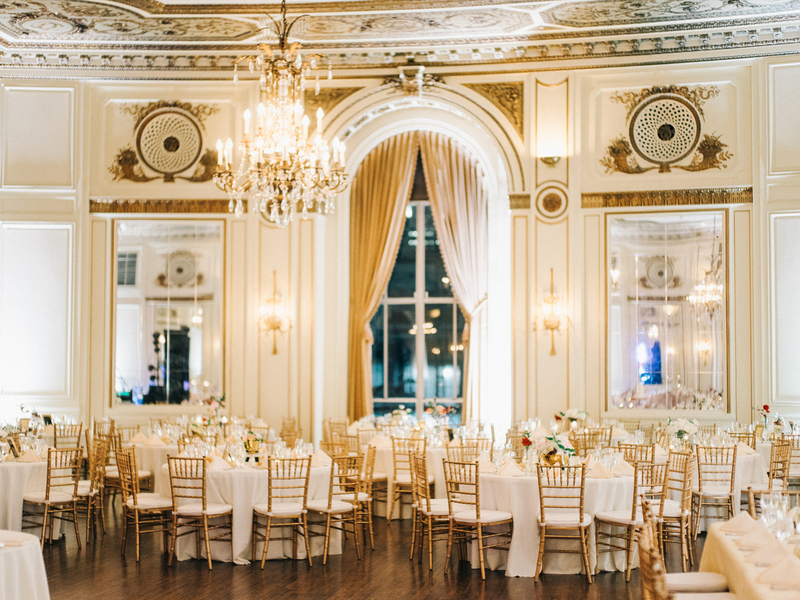 Entering the ballroom guests were greeted with sparkling chandeliers, beautiful crown molding, and glowing candles. 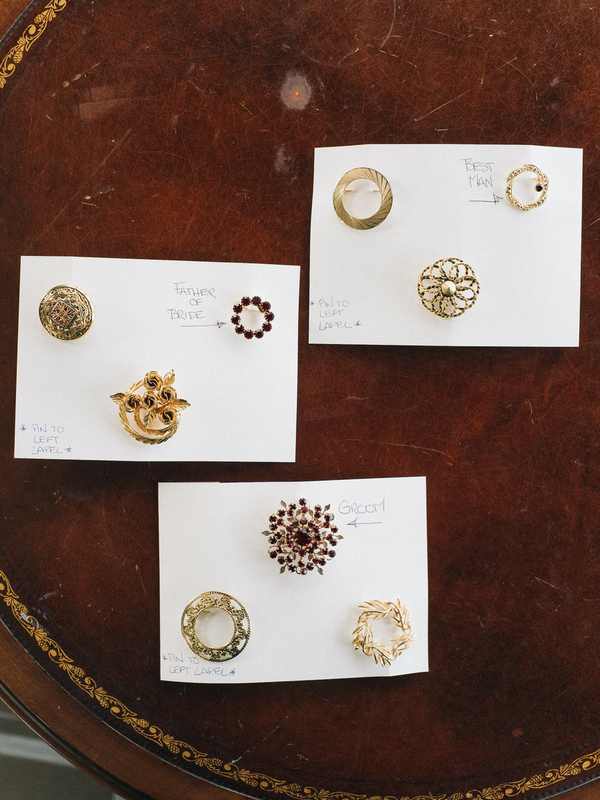 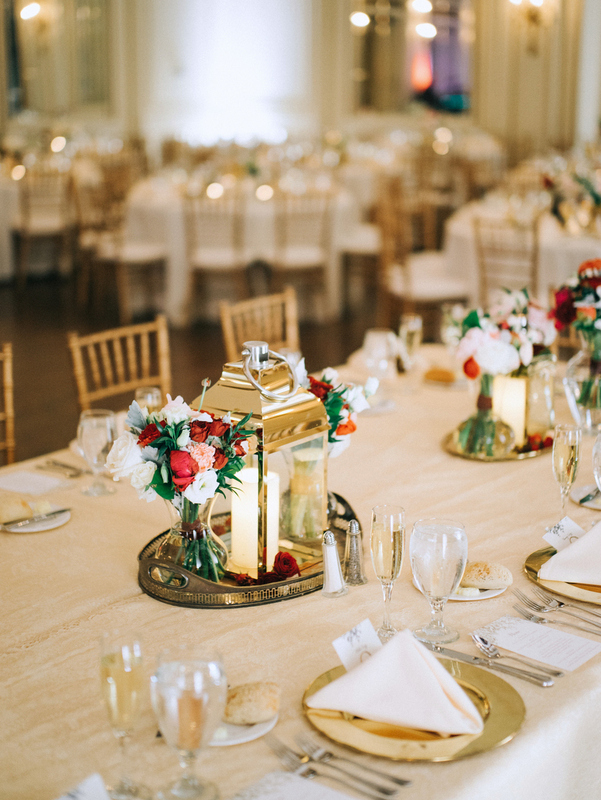 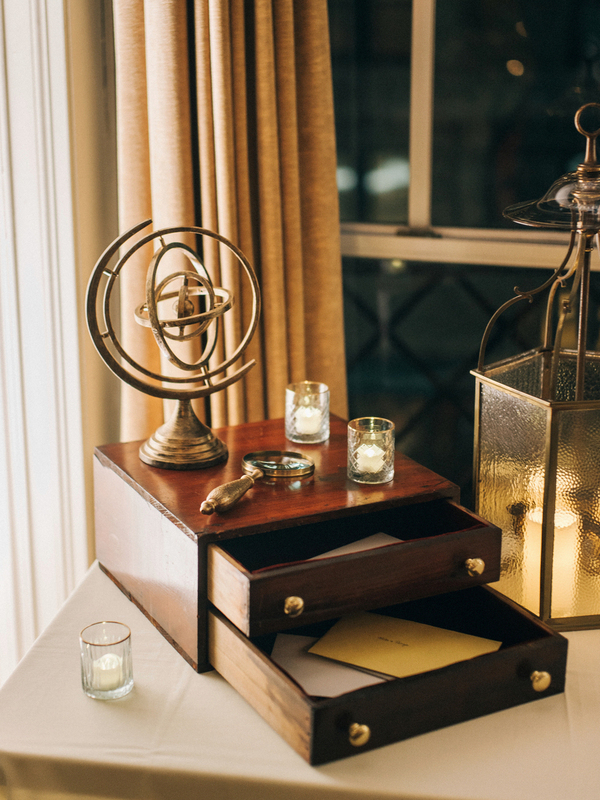 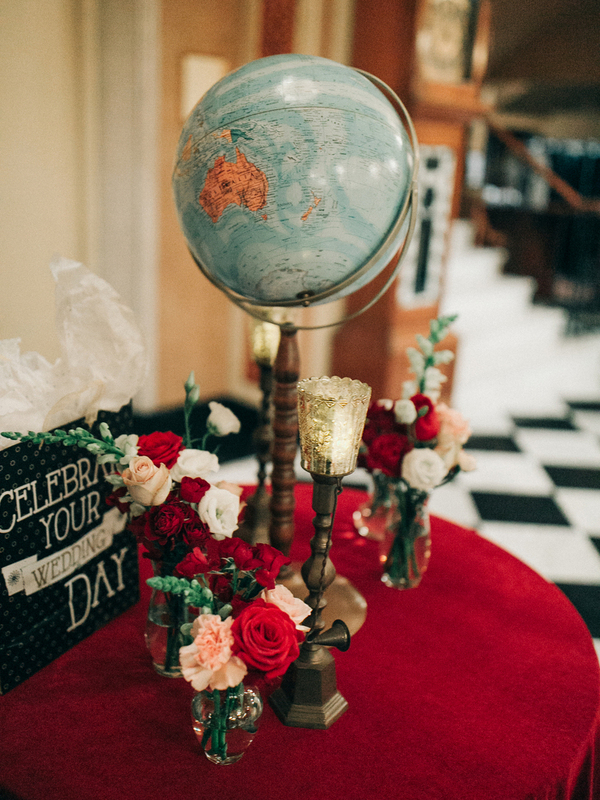 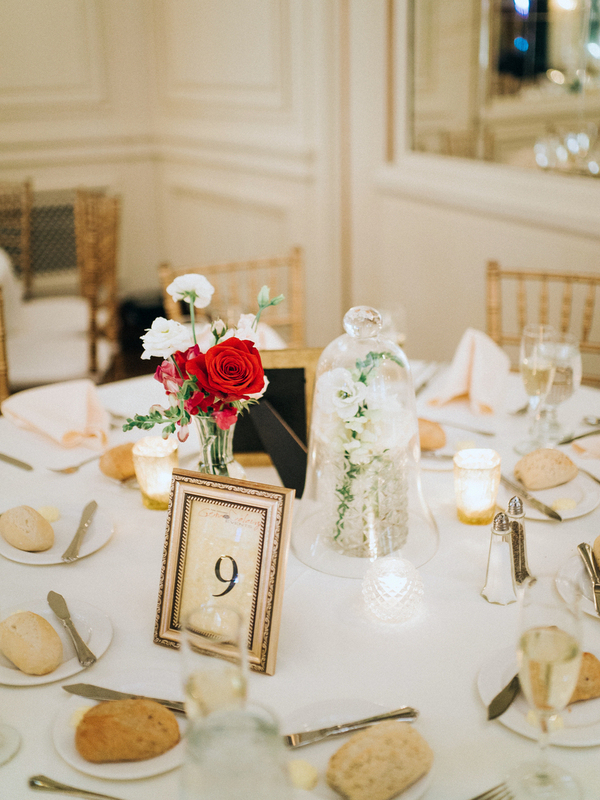 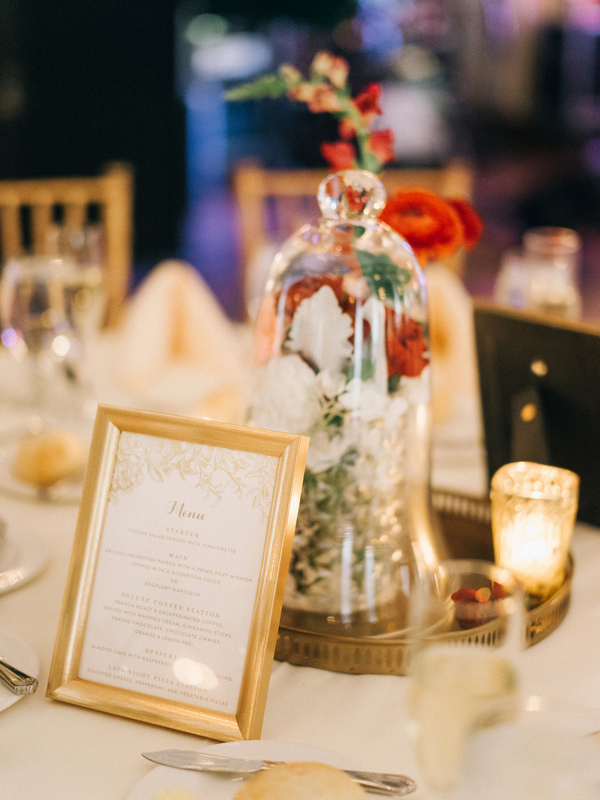 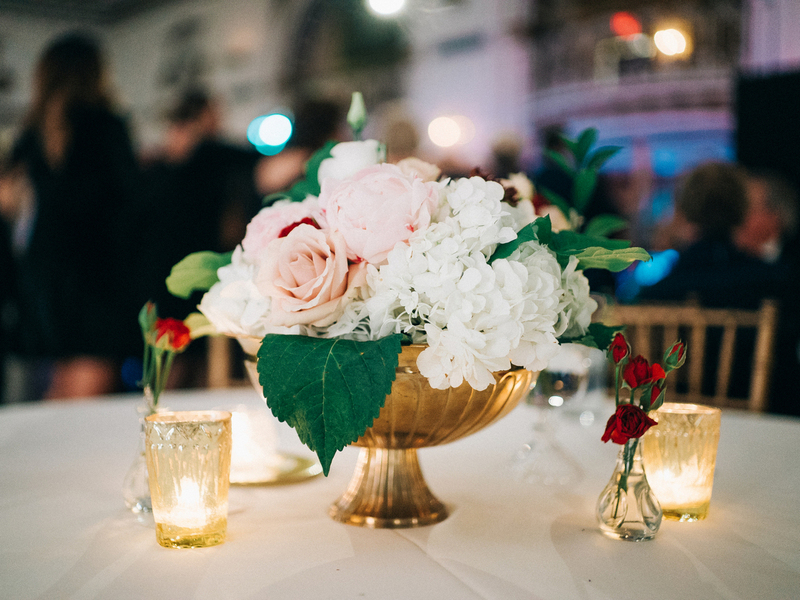 Every centerpiece was a mini vignette, consisting of different vintage items that had all been gathered by Katherine. 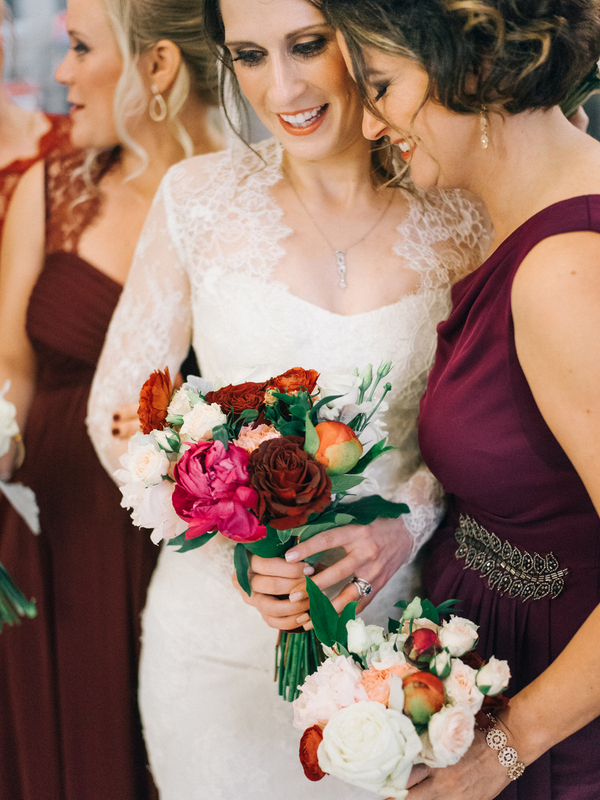 Being a part of this gorgeous wedding was a dream and getting to work with a previous bride is always a plus. 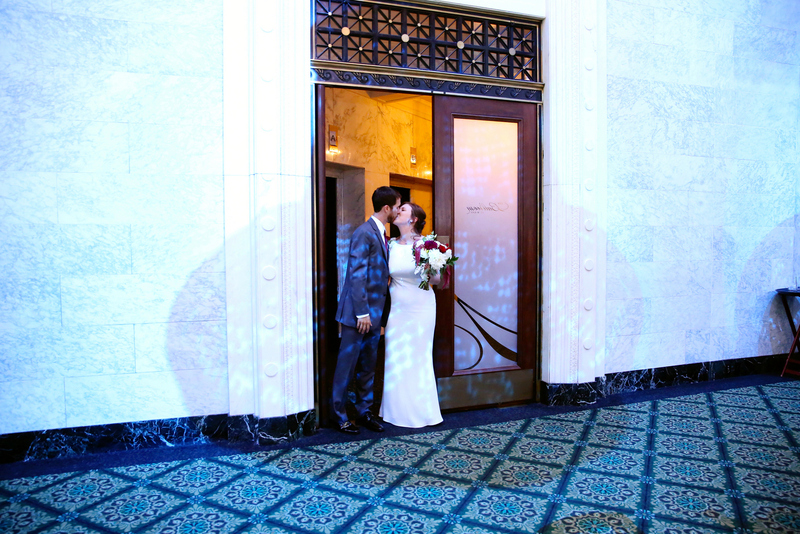 Congratulations Mike and Tanya and thank you for letting us be part of such a special day!